1.3 Why is 1900 an Important Year? 1.4 What is Meant by "Developed English Speaking World (DESW)"? This body of work analyzes architectural and urbanizational trends along with their political influencers and elicited social effects, observed in the developed English speaking world (DESW) from the year 1800 to 2010 primarily through the aggregation of municipal population data along with data regarding the different forms of transportation and services available to these municipalities during the analyzed time. This body of work also proposes theoretical framework to analyze the information collected. Through the aggregation of population data and the studying of architectural and urbanizational trends, you gain insight into the factors that shape urban centres physically, through the analysis of architecture and technology, and politically, through the analysis of municipal boundaries. Also, the factors that facilitate population growth and contribute to depopulation which influence a municipality’s absolute and relative population magnitude, can also be observed. All of this can be inferred due to the fact that the presence of municipal governments, which are the governing political body of an urban entity, and architecture, which make up the physical component of an urban entity, are dependent on the presence of humans, who are represented by the population figures, who create them. With this analysis, the body of work critically examines the trends that have occurred architecturally, politically, socially, and urbanizationally during the analyzed time period with a focus on social inequality. Some of the primary topics include overpopulation, suburbanization and white flight, sanitation, gentrification, imperialism, public transit, ethnic ghettos, and urban aesthetics. With the world becoming ever more urbanized to an extent that has never before been witnessed, an analysis of the progression of urbanization is important to reflect upon. Needless to say, the promulgation of this work to the general public for educational purposes is important, with this work having many applications for intellectuals, researchers, students, policy makers, historians, and urban planners. This article is part of a series of articles which constitute a body of work that I consider to be a treatise. It is constantly in progress and from time to time you may notice revisions. Although I strive to make all of my work coherent in style and flow to ensure easier understanding, since revisions can take a significant amount of time, some parts of this work may be updated before other parts which may cause some temporary inconsistency as I work on updating other sections. With the analyzed time range being 1800-2010, the year 1900 acts roughly as a median and is used as a baseline for comparison in this work. 1800-1900 represents an era in which many countries, particularly those in the DESW, progressed technologically, industrialized, grew, and gained wealth. The later part of this range represents an era that some may note for its visual whimsy and delight known as the Victorian era (formally 1837-1901, for this article 1860-1900 to reflect architectural stylings). After this era more modern ideologies concerning art, aesthetics, and architecture began to take hold. The days before 1900 are largely forgotten by modern society and obscured by popular culture. Disney, the Addams Family, Harry Potter, The Lord of the Rings, and fairly tales have all influenced how we view the past. Many people feel so distanced from the period before 1900 with the subsequent decades creating a buffer that even these decades themselves can feel like they were so long ago. Today, there aren't really people who were alive at that time who're still alive today who can remember living in this period. For my generation, the Cold War is a time before we can remember. 1900 is a pivotal year, a year amongst transition, a year beyond what most people remember. 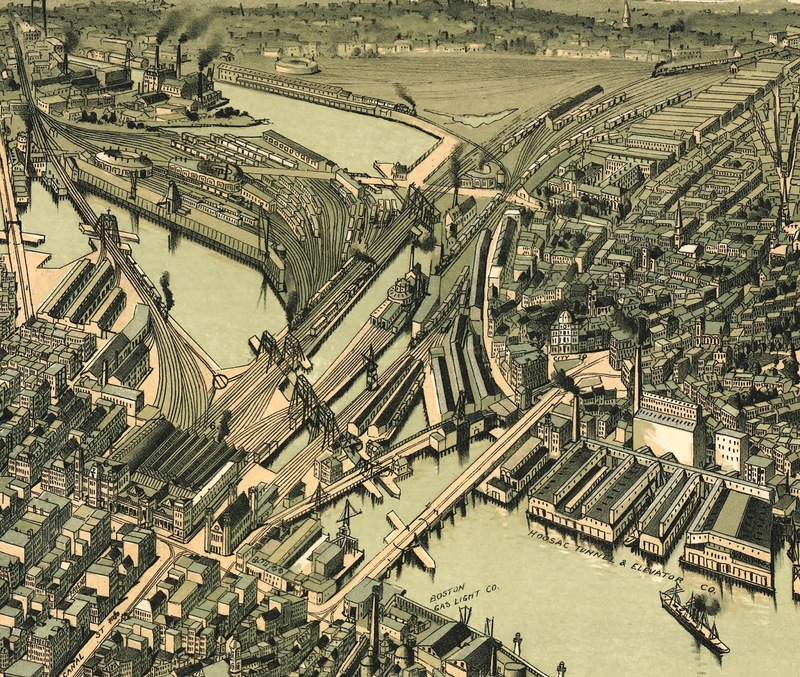 Maps and bird's eye views from the 19th century hold an incredible amount of information. Below are some examples of accurate (close to reality compared to what we have for reference today) bird's eye views. A lot of industry and new technologies can be seen such as steam boats, trains, factories; electric streetcars, rapid transit systems (Chicago Loop, NYC Subway), skyscrapers, and so on. Above, from left to right: (1) Boston in 1899, via Big Map Blog . 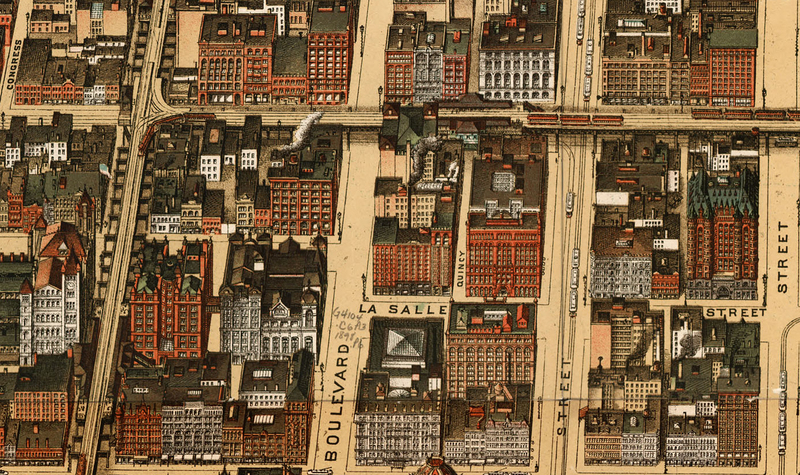 (2) Business district of Chicago in 1898, via Big Map Blog . 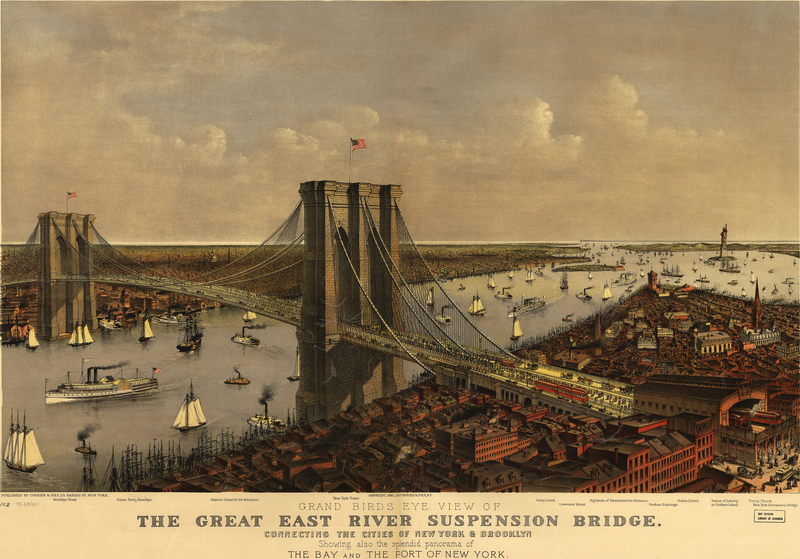 (3) Brooklyn Bridge c. 1885, via Big Map Blog . The skyscraper is said to have been invented in Chicago around the 1880's and by 1900 the city already boasted a skyline defined not by the heights of church spires or monuments, but by tall habitable buildings with many exceeding seven stories in height by utilizing a steel-frame construction. Interestingly, the phenomenon of early skyscrapers is isolated nearly exclusively to Canada, the United States, and Australia. Europe seemed to oppose them obstructing their urban landscape. For more examples, here's my Pinterest board for Victorian skyscrapers. Visible in the second image of the three above is the above grade level rapid-transit system known as "The Loop" already functioning in the 1890's. Electric streetcars can be seen on the streets as well. In the year 1900 Chicago was home to 1,698,575 inhabitants making it the third most populated municipality in the DESW and also the sixth most populated municipality in the world (my article for the world in 1900). The Great East River Suspension Bridge (Brooklyn Bridge) was opened on the 21st of May, 1883 between the cities of New York and Brooklyn (now a borough of the former). In the year 1900 New York City was home to 3,437,202 inhabitants, making it the second most populated municipality in the DESW and the second most populated in the world only behind London. Below are illustrations of banks, insurance companies, businesses, etc. that were drawn around the border of a map produced by Burk and Mcfetridge in 1886 . In the year 1900 Philadelphia was home to 1,293,697 inhabitants making it the fourth most populated municipality in the DESW and the ninth most populated in the world. 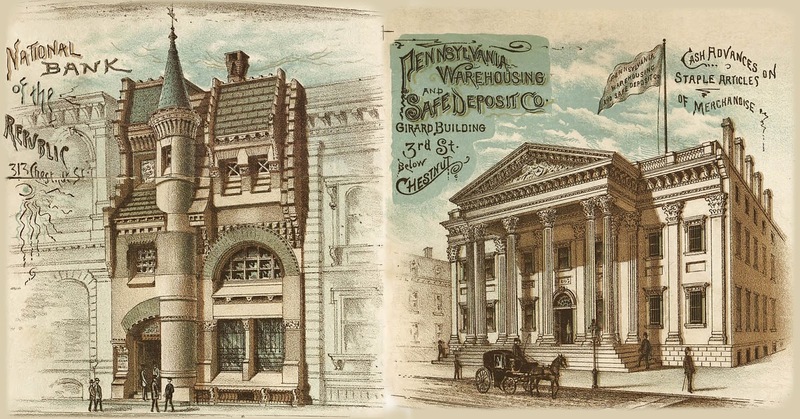 (1) National Bank of the Republic, 313 Chestnut St. | Pennsylvania Warehousing and Safe Deposit Co., Girard Building 3rd St. below Chestnut. Cash Advances on Staple Articles of Merchandise. (2) German Fire Ins. Co. of Philadelphia, 412 Walnut St. | The Beneficial Saving Fund, 12th and Chestnut Sts. 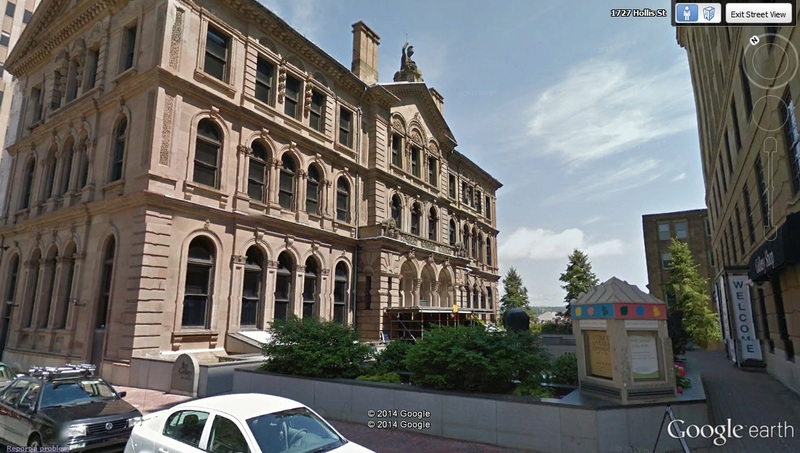 (3) The Providence Life and Trust Co., 409 Chestnut St. | Merchant's National Bank, 108 South 4th St. Retrieved from the Big Map Blog . It would appear that where Europeans immigrate, a privilege immigrates with them. Beginning in the 1500's Europeans have come to control much of the land on the planet at some time or another. The British and Spanish Empires have been referred to as "the empires on which the sun never sets" due to their global reach. It was in Britain that the industrial revolution began around 1760 which furthered its wealth and power. Within the British Empire different areas had different levels of British settlement with some of them being made settlement colonies where more immigration may have occurred. It's in these areas, particularly the United States, Canada, Newfoundland, Australia, New Zealand, and to some extent the British controlled areas in southern Africa, white immigration was most active bringing more wealth to these areas and subsequently more impressive architecture due to a growing bourgeoisie. Since the British Isles were at the head of the empire which controlled at different times even more places than those analyzed in this article, they experienced an immense amount of wealth and power. In this article, the "developed English speaking world" or "DESW" for short, is used to refer to these places collectively. Other European empires also had possessions where many people from the parent country immigrated to these possessions but this article focuses largely on the ones that have been related to Britain. This is to build an idea about the characteristics of British derived architecture and power and to later compare it to the architecture from other empires that will be analyzed in subsequent articles. Both the British controlled areas in southern Africa and Quebec might be the most objectionable inclusions in this data. Both of them had a lot of British influence by 1900, Quebec having been under British control since 1763 and the Cape Colony since 1814. Despite this, most of Quebec still spoke French aside from the major city of Montreal which since the late eighteenth century until the latest couple of censuses had been the most populated city and the financial and industrial capital of Canada. Due to the city having such a pull for immigrants and power, this caused the city to have a significant English speaking population by 1901. 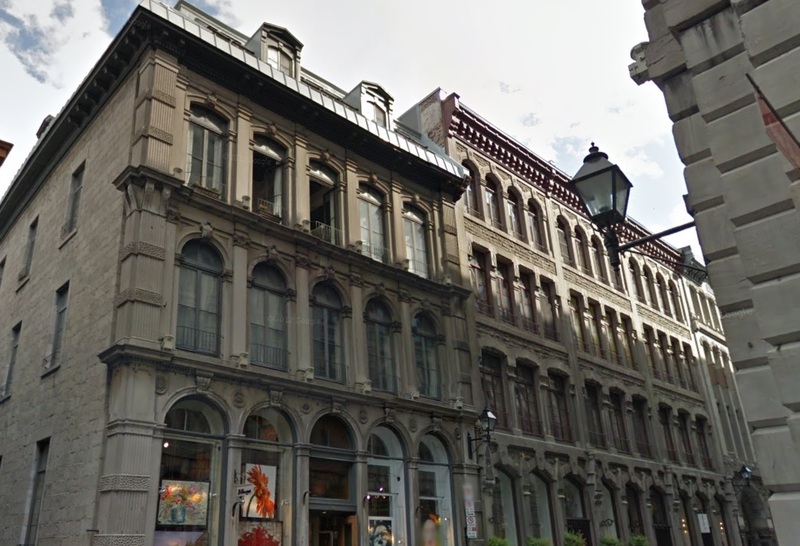 A scene showcasing 19th century architecture in Old Montreal, Quebec, Canada. Explore on Google Street View. By the 1904 census, the British colonies in the southern region of Africa had also pulled a number of British, and before British rule, Dutch settlers to colonize the area as is illustrated in the table below. It lists seven of the eight most populated urban agglomerations in the area of contemporary South Africa in 1904 and details how many were white and what percentage of the total population was white. An asterisk means an agglomeration population is used opposed to the population proper. A breakdown of seven of the eight most populated urban agglomerations in the area of South Africa in 1904 . My hypothesis as to why there was more European settlement in southern Africa than in areas like India or Malaysia is because they viewed the land usage of the indigenous people as inferior because they were hunter-gatherers . The Europeans appropriated the arable land and confined the indigenous population to reserves on land that was deemed as less productive so they could farm the more productive land . This process wasn't possible in India and many other parts of the British Empire due to the land already being under cultivation. The other areas included in the DESW also attracted white settlement which prompted indigenous resettlement like that observed in the southern parts of the African continent. These include all of North and South America, Australia, and New Zealand. Although many languages are spoken in contemporary South Africa with speakers who use English as a first language only making up 9.6% of the population and despite the fact that South Africa isn't currently considered to be a developed country (although noted for being "on the rise"), it is due to the abundance of British influence, especially on its pre-1900 architectural stock that leads to its inclusion in this article. One might wonder why there would be a greater stock of infrastructure built by the British in the southern areas of the African continent than among their other possessions even in Africa itself. There are a couple of likely reasons as to why this is so. One, British settlement was encouraged to help keep control of these territories which pushed the original Dutch settlers away from the original Cape Colony to new locations where they formed their own republics (notably the Orange Free State, the South African Republic, and Natalia, all were eventually conquered by the British) that also built infrastructure. Two, gold, diamonds, and other valuable resources were discovered in the area which lead to more infrastructure such as railroads being built to help extract them. Below are two maps from 1907. The first one illustrates grazing land and industrial districts (legend in lower right). Railways are also included but the second map illustrates the principle railways clearer with red lines (legend lower left). A map illustrating the industries present in southern Africa. Bartholomew, J. G. (1907). Atlas of the World's Commerce. . Examine original map. A map clearly displaying the railways present in southern Africa. Bartholomew, J. G. (1907). Atlas of the World's Commerce. . Examine the original map. The infrastructure and urbanizational trends that are present in the area of southern Africa are more in line with those of Canada and Australia than they are with the rest of Sub-Saharan Africa. Most of the other British controlled areas of Africa weren't even given a formal census around 1900 despite some of them having considerable urban populations. Below is a piece of the same map by Bartholomew above that clearly shows the railways present in 1907. 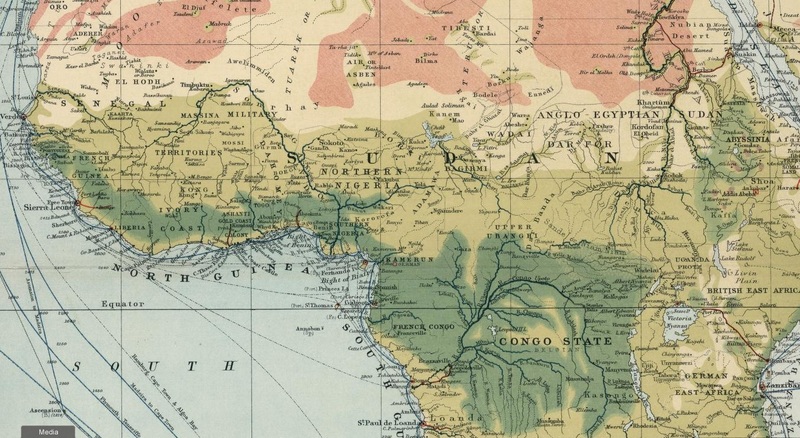 This view is of the area of the continent north of the southern areas being analyzed in this article to form a comparison as to how developed other parts of Africa were at the time. A map clearly displaying the railways present north of the southern areas of Africa. Bartholomew, J. G. (1907). Atlas of the World's Commerce. . Examine the original map. In the map above there are minor railways that can be seen going from the African shores inland slightly penetrating the continent. The two most noticeable railways are likely the ones in British East Africa (modern day Kenya on the east coast) and the one following the Nile River in Anglo-Egyptian Sudan (modern day Sudan and Egypt). Other than this, the rest of this section of the African continent is vastly underdeveloped in terms of railroad development compared to the analyzed parts of southern Africa. 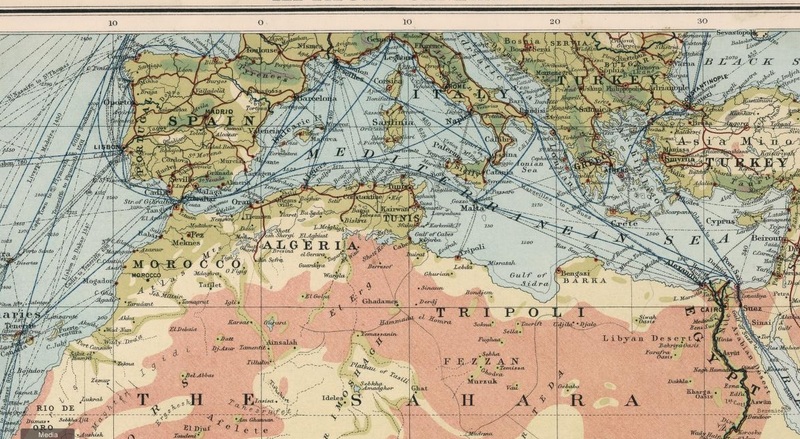 Within North Africa, Algeria and Tunisia were substantially more developed in this regard as shown in Bartholomew's map below with the same field of view as the above map sections. A map clearly displaying the railways present in North Africa and southern Europe. Bartholomew, J. G. (1907). Atlas of the World's Commerce. . Examine the original map. With the British being the primary ones in power over the area and developing its infrastructure, this lead to a number of architectural similarities with the rest of the DESW. It is also important to take into account the influence of the original Dutch settlers who also left a mark on some of the architecture which can be seen in many areas (discussed later in article). Graham's Town, Cape of Good Hope (South Africa). It bears a close resemblance to Australia and New Zealand, all of which have a strong British influence and are located in warm climates. Explore on Google Street View. In extending the definition of the DESW to include the areas found in South Africa I mean to use the definition to highlight a privileged white English speaking class that has had direct power and influence in an area opposed to whether or not the entirety of a political entity would be considered to be "developed". This extension extends across present day Lesotho, Swaziland, Botswana, and Zimbabwe. The first two are enclaves mostly surrounded by contemporary South Africa while the last two are located to the north. 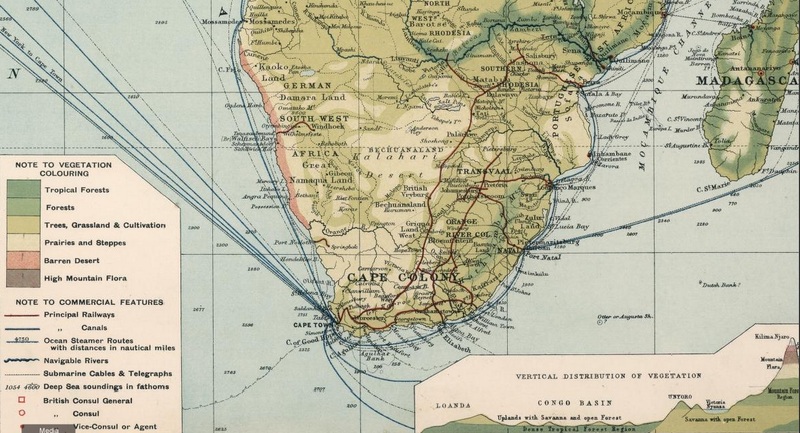 The northern two were connected to contemporary South Africa by a rail line that can be seen on the maps shown earlier in this article. Zimbabwe attracted white settlers due to its good farming lands, who drove the original populations to reserves and appropriated their land. There are a couple of areas that although they were under the control of Britain, developed and obtained a considerable amount of wealth, they are not included in this article. Mainly Hong Kong (1901 pop. 283,978) and Singapore (1901 pop. 193,089). In their cases, they didn't attract much white settlement and they developed a bit of a different kind of architectural style than that of which observed in much of the rest of the DESW. In Singapore and much of Malaysia, a fusion of Eastern and Western architecture occurred creating something unique. Here, what are commonly known as "shophouses" developed. They are similar in concept to other places in the world where a business is located on the first storey and subsequent stories up are usually for residences or offices. The difference here is mostly in the style and how identifiable they are in this area of the world. (1) A common nineteenth century street in Singapore lined with shophouses. Explore on Google Street View. (2) Old Parliament House, Singapore. Built in 1827 in the Neo-Palladian style (a very Western example). It was initially intended to be a private residence for a Scottish merchant. Explore on Google Street View. (3) Sai Ying Pun Hospital Building, Hong Kong. Built in 1892. Due to much of Hong Kong having been redeveloped, finding historic architecture in the present day is difficult. Explore on Google Street View. Urban Entity: A general term to refer to anything that could be considered urban. Urban Area/Urban Centre/Built-Up Area: The continuous physical urban area with a single primary urban core (monocentric). This definition is independent of formal municipal incorporations. Urban Core: The heart of a morphological urban centre. Traditionally it is typically complete with many services that are necessary for an independent entity to function (e.x., municipal government buildings, commercial buildings, office buildings, and factories). Peripheral Node: Is a minor urban core within an urban area. It may include pre-1900 structures or completely modern structures (e.x., Downtown Brampton, Ontario is a peripheral node of metropolitan Toronto). Neighbourhood: A distinct component of a morphological area. Municipality: The formal incorporation of an entity. This includes a political boundary marking the limits of the incorporation (e.x., city limits). Commonly bestowed the title of village, town, borough/burgh, or a city. I refer to these as a "municipal designation". Populations are typically dependent on municipal boundaries, with the area within which they represent. Ward: An administrative division of a municipality. Municipal Relationship: The entity's relation to nearby municipalities. In general I describe the relationship as being dependent or independent and I break down this relationship further in the article. Municipal relationships are not static and can change over time. Amalgamation: The process of combining or uniting multiple entities into one form. The act is often referred to as a "consolidation" or "merger". For example, Port Arthur and Fort William, Ontario amalgamated to form the new City of Thunder Bay. Annexation: The acquisition of smaller entities that are absorbed by a significantly larger dominant entity. For example, the cities of Saint-Henri and Sainte-Cunégonde have been annexed by the city of Montréal (Example elucidated further in this section). Primary Predecessor Municipality: The dominant independent municipality that existed during a time prior that absorbed other dependent municipalities through the process of annexation. Almost always the name of the dominant municipality is retained while the names of the annexed municipalities are lost through this processes. Agglomeration (Small-Scale Urban Morphology): If the urban area is composed of more than one municipality with just one primary urban core (monocentric) the collective of these municipalities is called an "agglomeration" (e.x., the Greater Toronto Area is comprised of the municipalities of Toronto, Mississauga, Brampton, etc.). A highly populated urban area or agglomeration is often referred to as a "metropolis" or "metro" for short. It can also be referred to as the "Greater Area" as in the "Greater Toronto Area". Conurbation (Regional Urban Morphology): An area with more than one primary core (polycentric) that is highly interdependent (e.x., the Minneapolis-St. Paul Combined Statistical Area). These tend to transcend many municipalities. Megalopolis (Large-Scale Urban Morphology): A large scale morphological trend observed among an area with more than one primary core (polycentric) (e.x., the Northeast Megalopolis). These tend to transcend a vast number of municipalities. Community: The group associations between people that take place. Although it would be nice to simply be able to rely on figures collected for municipalities many times they do not necessarily correlate with morphological urban areas. For example, below is a section from Rand McNally & Co.'s Enlarged Business Atlas and Shippers' Guide. (1903). of the City of Montréal and surrounding municipalities. The pink on the right side of the map denotes the area within Montréal's municipality and the pieces on the left that are in orange, yellow, and pink are separate municipalities. The City of Saint-Henri is in pink in the upper left and was home to 21,192 inhabitants in the year 1901 making it the eleventh most populated municipality in Canada and the 212th most populated out of the data analyzed in this article. Between it and Montréal is the City of Sainte-Cunégonde which is another municipality which was home to 10,912 inhabitants in 1901 making it the 24th out of Canada and 411th out of the data analyzed in this article. The western end of the City of Montréal from Rand McNally & Co.'s Enlarged Business Atlas and Shippers' Guide. (1903). Examine the original map. Between these three municipalities there's not much morphological distinction between them. If you didn't know any better you wouldn't know that you have left the City of Montréal and passed through the City of Sainte-Cunégonde and entered the City of Saint-Henri. This is where the concept of a morphological urban centre comes in. Morphologically we can consider all of these municipalities which have likely experienced much economic and urban development due to their proximity to Montréal as a morphological part of Montréal. With the morphological, functional, and developmental association between these municipalities comes what I refer to as a relationship. Montréal is morphologically and functionally independent as a municipality in that its existence as a municipality is not contingent on the existence of another nearby entity. The surrounding municipalities on the other hand have a dependent relationship in that a large degree of their existence is contingent on the existence of Montréal being nearby. Municipalities that possess a dependent relationship like this may often lack the characteristics found in independent municipalities like a formal urban core. Conversely, these municipalities may benefit from the services located within the municipality they are dependent on. For example, the proliferation of electric streetcars in the late nineteenth and early twentieth centuries promoted the growth of streetcar neighbourhoods and politically independent municipalities which had a dependent functional relationship with a primary municipality. Within all of this there may be communities of people that associate with each other. 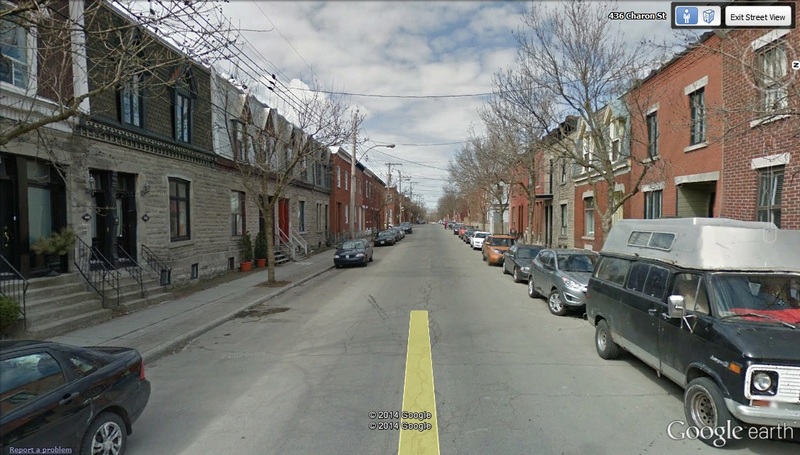 To the south of the middle of the map section above is an area of Montréal called Pointe-Saint-Charles (not seen in the above view) that was an Irish working class neighbourhood. Although it is politically part of the municipality of Montréal and it is also very much so within its morphological structure, it was distinct in its community. Another point to note is that not all morphological urban areas (or not all parts of them) are incorporated as municipalities. For instance, Mount Holly, New Jersey which is the county seat of Burlington county was unincorporated in 1900 and subsequently doesn't rank among the data in this article despite having signs of having had a population that would have likely had it rank if it was incorporated. A scene along High Street in Mount Holly, New Jersey. It is home to many townhouses. Explore on Google Street View. Like how not all urban areas are municipalities, not all municipalities are conterminous with an urban area. This was a great problem regarding data aggregation for New England's urban areas since nearly all of its surface area is divided into municipalities called "towns" that all possess a town hall but are not necessarily conterminous at all with urban areas. Unlike the other areas analyzed in this article, New England towns were similar to townships and frequently included forest, rural area, hamlets, or even larger urban areas. Politically they took on responsibilities usually given to both municipalities and counties leaving county governments either weak or non-existent. Below is a piece of a map published in 1891 of showing the municipal boundaries of some New England towns in red. A section of a composite map of Massachusetts published in 1891 by Geo. H. Walker & Co. . Examine original map. Since there is not necessarily any correlation between a New England town and an urban area, most New England towns are excluded from the data analyzed in this article. The ones that are included are the ones that the U.S. Bureau of the Census indicated as municipalities that reflected urban areas in 1900. Due to this, the distribution of municipalities by population for much of New England appears unnatural and different from the other areas analyzed in this article. While other administrative divisions have plenty of municipalities in the lower range of their data, Massachusetts' least populated municipality that ranked in the data was home to 12,062 inhabitants in 1900, for Rhode Island it was 18,167, and New Hampshire 5,846. For these states the only formal municipal incorporations belonged to the more populated urban centres like Boston, Providence, Portland, and Worcester. 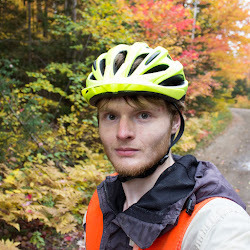 A screenshot from the interactive Google map included in this article showing the lack of less populated municipalities in the New England area. The icon colours other than solid red or yellow indicate a municipality with less than 5,000 inhabitants. The yellow circle is highlighting the area in question. On the opposite end of the spectrum of the issue observed in New England is the one observed in London, England and many of the urban areas of Australia, New Zealand, and South Africa. Some urban areas happen to be larger than their municipal incorporations on such a scale that an agglomeration population is used opposed to that within the limits of the municipality proper. A number of Australian, New Zealand, and South African agglomeration population figures came from the census of the British Empire (1901) , since even in 1901 the formal boundaries weren't considered to be representative of the actual population of these urban areas. 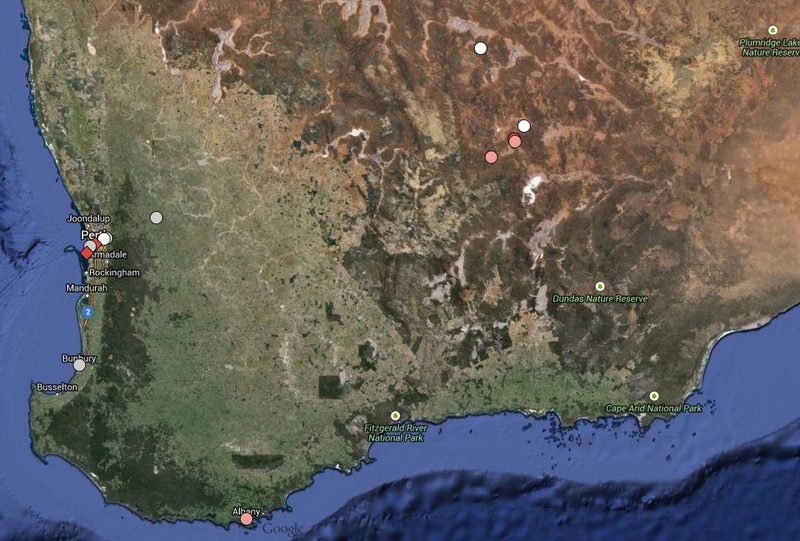 For the municipalities of Adelaide, Charters Towers, Melbourne, and Perth the population within a ten mile radius of their post offices is used as their agglomeration population by the census sources used. For some of the smaller municipalities I added up the individual municipalities         myself to come up with an agglomeration figure. The table below highlights all of the municipalities in Australia, New Zealand, and South Africa that are used as components for agglomeration populations in this article (including the primary municipality they are added to). The first column contains the name of the municipality (the primary municipality is marked by an asterisk) and the second the name of the agglomeration it is included as part of. The third and fourth columns are used to identify its location. The fifth column is the population of the municipality proper and the sixth is of the agglomeration's population and is only stated for the primary municipality. If the population of an agglomeration as quoted by the source is greater than that of the municipalities listed then a "(Rest of Vicinity)" row is added. Sometimes the population source quoted the population of the districts surrounding the primary municipality and these are included instead of a "(Rest of Vicinity)". All of the municipalities in Australia and New Zealand that are part of agglomerations in this data. Below is a map of London, England in 1901. The grey areas are urban "built-up" areas which are conterminous with Inner London, the boundary of which is marked by a thin red line. In the middle of the grey area is a small area that is marked in yellow, this is the City of London's municipal boundaries. Outside of Inner London is Outer London which is marked by the pink area and the periphery by a thicker red line than the Inner London boundary. 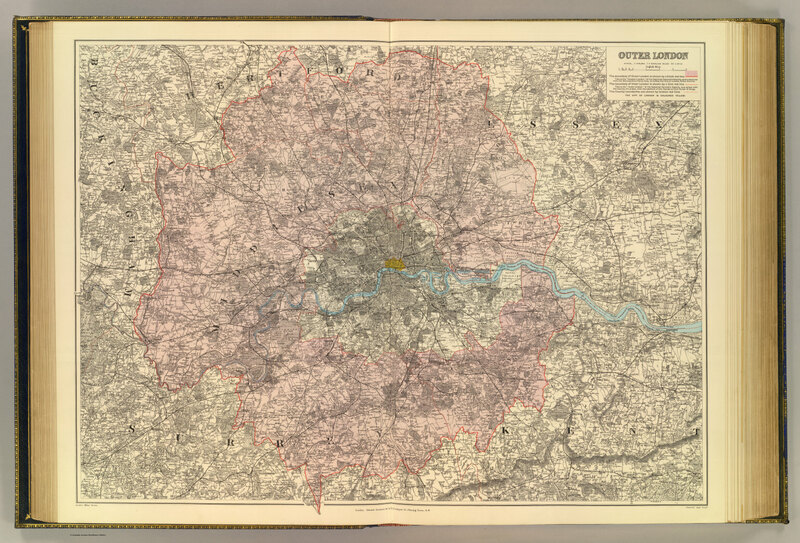 Stanford's 1901 atlas map of London, England . Examine original map. The City of London proper contained a mere 26,923 inhabitants at the 1901 census. This is vastly under representative of the actual population associated with what was considered the most populated urban area in the world at the time. It is due to this that in this article I use Inner London's population of 4,536,541 which is more conterminous with the urban area. Below is a table breaking down Inner London which is conterminous with the County of London by boroughs ordered by population. A breakdown of the boroughs that made up London, England in 1901 by population. In the United Kingdom the secondary administrative divisions that fall below counties are urban and rural districts. As one would imagine urban districts are incorporations usually around urban areas and rural districts are incorporations around rural areas. An issue arises since some urban districts in England and Wales particularly, do not strictly conform to just one or necessarily any urban area although most do. In these cases sometimes an urban district may have incorporated a several urban cores within an interconnected area like the Rhondda coal mining valley in Wales. Rhondda, which is included in this article was home to 113,735 inhabitants in 1901. Part of an Ordnance Survey sheet of the Rhondda Valley . Information c. 1950. Examine the full resolution overlay. In the map above you can see the two valleys that make up the Rhondda Valley; the larger Rhondda Fawr Valley and the smaller Rhondda Fach Valley which the urban district of Rhondda was based on. Sometimes when two or more urban areas that make up an urban district in the United Kingdom it is reflected in the district's name. For example; Kings Norton and Northfield; Denny and Dunipace; Alvaston and Boulton. Other times urban districts may not be very urban in character lacking any noticeable urban core. This tends to occur the most in England within the county of Yorkshire (West Riding) particularly, but also in the county of Lancashire. This particular area is quite dense with many highly populated municipalities, suburbs, and factory towns. My hypothesis is that due to the density of the population this increased the number of urban districts despite many areas lacking a well defined urban core. Another thing to keep in mind regarding the municipalities found within the British Isles is that they tend to have a higher population threshold necessary for incorporation as an urban district to take place. It is due to this that a number of urban areas that may have had more than 1,000 inhabitants in 1901 may not be present in this data because they didn't happen to be incorporated as an independent urban district. One thing to note regard the Cape of Good Hope Colony is that it did not report a population figure for municipalities with less than 2,000 inhabitants. Due to this, that range is nearly entirely absent from the data aside from a few figures from Encyclopædia Britannica's municipality specific articles. An exception to note concerning the American population data is that although St. Joseph, Missouri's official population figure for 1900 was 102,979 inhabitants I have calculated a different figure of approximately 68,000 inhabitants. I did this because the official number was questionable since the civic leaders at the time tried to artificially inflate St. Joseph's population count . When one looks at the trends for St. Joseph, the population in 1890 was 52,324 and in 1910 it was 77,403. There is no known explanation for why the population would have lost 25,576 inhabitants during the first decade of the twentieth century. This is a very significant decline especially at that time since many municipalities were still growing. Another exception to note is that although the United States Bureau of the Census cites the population of Caroleen, North Carolina as 1,706 inhabitants, it appears to have been an error. Although Hawaii isn't part of North America, I include it in the data since it is currently a constituent state of the United States. I exclude Puerto Rico and other United States possessions that still retain the status of territory in the United States today. United States territorial possessions in the Americas around 1900 are included in my Americas article though. One thing to note about Honolulu is that although it is an incorporated municipality, it is coextensive with a district and likely was larger in area than the average American municipality potentially including more rural population. In this article I almost exclusively aggregate and analyze municipalities that were present in the year 1900 for the United States and the year 1901 for Canada and the rest of the British Empire (except southern Africa, which is for 1904) since Britain, its dominions, and its colonies did censuses during the second year of each decade opposed to the United States which did them during the first year. There is an exception though. The primary source used for Canada's population, Dept. of the Interior, Canada. (1906). Atlas of Canada. included eleven unincorporated urban areas with a population of more than 1,000 inhabitants in the data that it provided. I still included these areas although they weren't incorporated. The data for the United States which came from the United States Bureau of the Census. (1900). only cited formally incorporated municipalities. Rand McNally & Co.'s Enlarged Business Atlas and Shippers' Guide. (1903). contained population data that correlated with that from the United States Bureau of the Census. (1900). but it also included figures for unincorporated places in the United States. I realized that these figures were typically too large for the urban areas they specified and they likely included the surrounding rural population so these were not included in the data used in this article. Newfoundland's data is very difficult to come by since it was a colony and not yet part of Canada at the time. Several good figures were found for the urban areas with more than 5,000 inhabitants from Darling & son Ltd. (1901). Census of the British Empire. I'm pretty certain that all that had more than 5,000 inhabitants are included in this article. Some of those under this threshold were estimated based on populations before and after the year 1900. The Census of the British Empire was also used for all of the data for the British Isles but only the major municipalities for Australia, New Zealand, and South Africa. For Australia I had to find reports that were state specific. Sources 58-66 all pertain to Australia and New Zealand. for Tasmania,  for Queensland,  for Victoria,  for New South Wales,  for South Australia,  for Western Australia, and  for New Zealand. All were printed by each state's government printer. For the four main colonies that made up South Africa, data for the more populated municipalities also came from the Census of the British Empire. For the less populated municipalities I utilized more specific censuses  and Encyclopædia Britannica  which appears to contain copies of the exact same information. Some of the data for Transvaal came from an article about the municipal engineers of South Africa which was published by Tampere University in Finland . 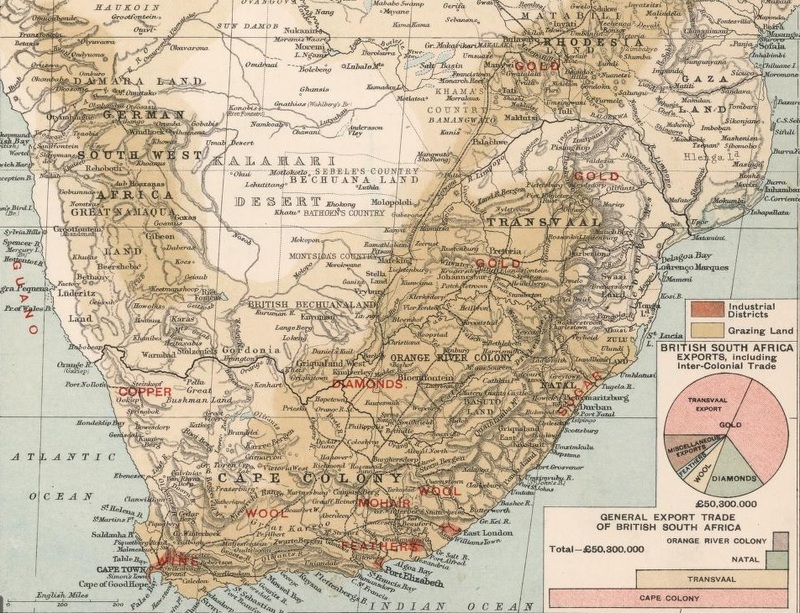 The censuses for all of the colonies in South Africa were taken in 1904 and the political entities listed in this article will reflect their statuses in 1904 (i.e., the South African Republic is the colony of Transvaal and the Orange Free State is the Orange River Colony). Although Encyclopædia Britannica cites Barkly East in the Cape of Good Hope colony as having 8,490 inhabitants at the 1904 census, the Census of the British Empire does not list Barkly East when listing all municipalities with a population exceeding 5,000 inhabitants. It is because of this that Barkly East is excluded from the data. Bartholomew, J. G. (1899-1905). J. G. Bartholomew & Son, Half. was a map used to help confirm the positions of municipalities in the British Isles. Rand McNally & Co.'s Enlarged Business Atlas and Shippers' Guide. (1903). was used for the railway, county, and county seat data for Canada and the United States. For railways that were under lease by larger railways, many of them were added under the lessee's data. The railway data from Rand's atlas is for around 1903 and if I know that a railway only opened between 1900-1903 I indicate so in parenthesis after the railway's name on the railway table in section 4.3. In collecting railway data for urban municipalities difficulties can arise. For instance, discerning whether or not a branch line that splits off 5 km outside of the municipality's formal boundaries should be included since it likely does provide a functional asset to the community despite being outside of the formal boundaries. Cram, G. F. (1901). Cram's Standard American Railway System Atlas of the World. was used to help add waterway data for Canada, the United States, and Newfoundland (all of Newfoundland's railway data too). It was also used to figure out the what counties the municipalities in Queensland, Victoria, and Western Australia belong to. 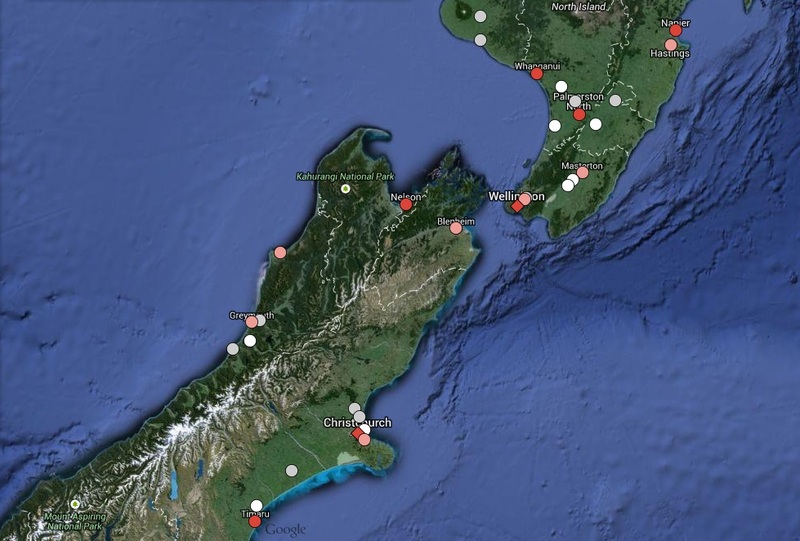 It was also used to determine what provinces each municipality in New Zealand belonged to as well. Stanford, E. (1901). Stanford's London Atlas of Universal Geography. 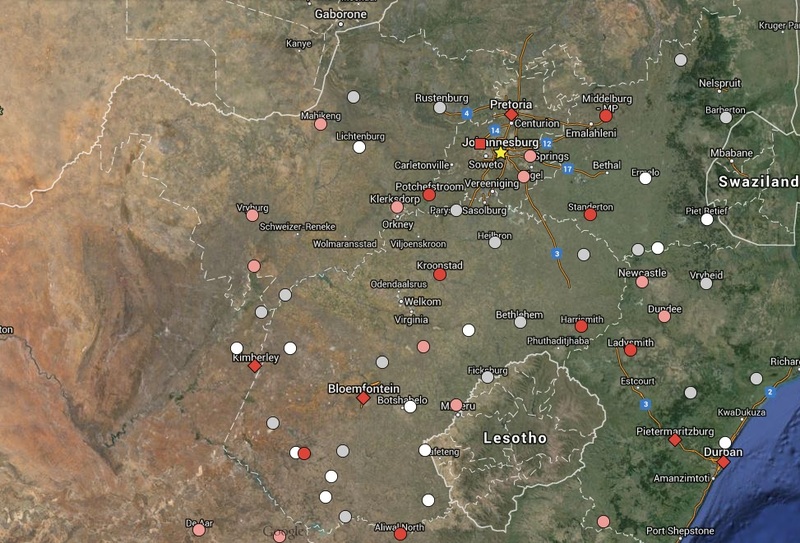 was also used to help confirm counties as well including all of the administrative divisions for southern Africa. Information from Dept. of the Interior, Canada. (1906). Atlas of Canada. and Dept. of the Interior, Canada. (1911). Atlas of Canada. was used for the electric streetcar line data and also for Canada's waterway data. It was also used to corroborate the population data that has been collected for Canada. Most of the waterway data for places other than North America. Municipal relationship data and designations for the British Isles other than the most populated places analyzed in this article. Modern primary administrative divisions for the United Kingdom. Currently, only the decennial censuses for around the year 1900 are included in the data. 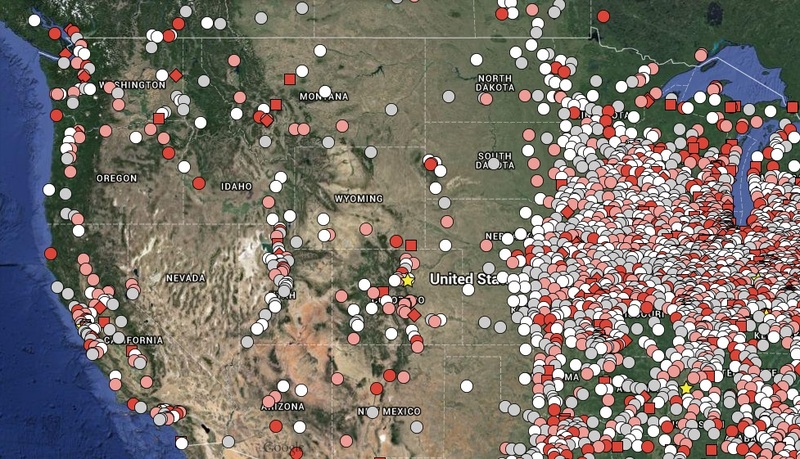 Although work is underway for expanding the data to cover every decennial census between 1800-2010, it is taking a significant amount of time since this is expanding the collection by twenty-one times. In time everything will be updated. # (Number): This column indicates the population rank of the municipality relative to all of the municipalities in this article. Municipality: The name of the municipality is given. Alternative spellings are separated by "/". If the municipality has been renamed the new name will follow in (parentheses). "*" means that an agglomeration population was used due to the municipality proper being vastly under representative. 2° Admin. (Secondary Administrative Division): The name of the secondary administrative division the municipality is located in (i.e., county, district, or parish [Louisiana]). If the secondary administrative division held the status of a district or division in 1900 the name is followed by "Dist." or "Div." respectively. If the secondary administrative division has changed name, amalgamated, dissolved, or reincorporated as a different entity, the new name will follow in (parentheses). 1° Admin. (Primary Administrative Division): The name of the primary administrative division the municipality is located in (i.e., state, province, territory, administrative county in case of the UK aside from Ireland which has provinces, etc.). If the primary administrative division held the status of a territory in 1900 the name is followed by "Terr.". If the primary administrative division has changed name, amalgamated, dissolved, or reincorporated as a different entity, the new name will follow in (parentheses). Constituent Entity: If the municipality is located within an entity that is part of a greater political entity the name of that constituent entity will be displayed in this column. (i.e., the constituent countries of the UK: England, Ireland, Scotland, and Wales; the crown dependencies of Jersey, Guernsey, and the Isle of Man). 2° Political Entity (Secondary Political Entity): The name of the political entity that the municipality is located in. i.e., United States (country), United Kingdom (country), Canada (dominion), Newfoundland (colony), Australia (commonwealth), New Zealand (colony), Transvaal (colony), Cape of Good Hope (colony), Natal (colony), or Orange River (colony). 1° Political Entity (Primary Political Entity): The name of the empire the political entity is located in. i.e., the British Empire (formal entity). Pop. (Population): The population of the municipality in 1900 if located in the USA, 1901 if located in the British Empire (except South Africa), or 1904 if located in what today makes up the country of South Africa. 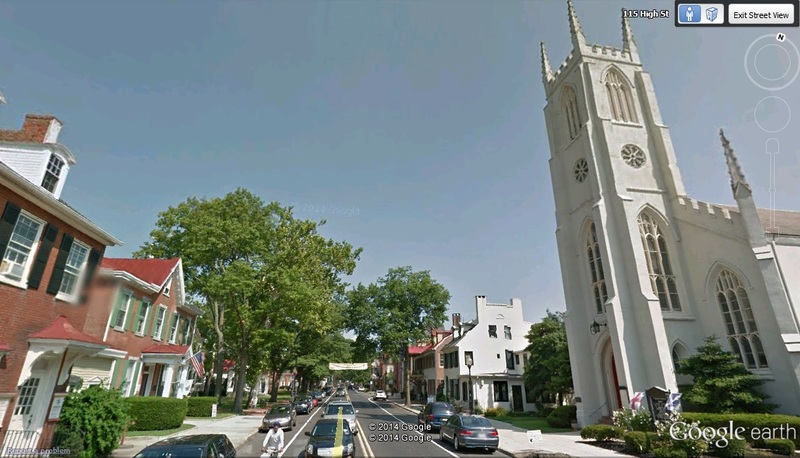 MD (Municipal Designation): The municipality's formal designation. The following lists the designations used by order roughly from highest status. City: Used most commonly in the United States. In Canada it was traditionally given to a municipality with more than 10,000 inhabitants. In the United Kingdom it is purely a ceremonial title. County Borough: Used exclusively in the United Kingdom. It is a municipal incorporation that is independent of the surrounding county. Municipal Borough: Used exclusively in the United Kingdom. It is a municipal incorporation that has a higher status than an urban district which would rank below it. Royal Burgh: Used exclusively in Scotland. It is a municipal incorporation established by royal charter. Urban District: Used exclusively in the United Kingdom. It is a municipal incorporation of lower rank than municipal and county boroughs and it doesn't really carry any ceremonial prestige like the title of "city". Urban and rural districts were the level of administration below that of counties. Town / Borough: Both a town and a borough are municipal incorporations usually similar in population size. "Borough" comes up most often for the state of Pennsylvania. Colloquially, "town" is used to describe many places in the United Kingdom that do not possess the official title of "city". Former Borough: Used as a municipal designation exclusively in Australia. It refers to a borough that has amalgamated with a surrounding shire. Uninc. City: Used exclusively in Alaska. There were no formal incorporations for municipalities in Alaska in 1900, but the US Bureau of the Census quoted figures for urban areas and those above 1,000 inhabitants were unofficially referred to as "cities". Village: Used officially most often in Canada and the United States. It is typically used to denote some of the smallest municipalities. It may also be used colloquially in the United Kingdom to describe a very small urban settlement. Township: Used as a municipal designation exclusively in Australia. It is equivalent to a village. Hamlet: A very rare title for a municipality that only occurs in four municipalities in Ohio. It is often used colloquially for an unincorporated rural settlement. Unincorporated: Used by 15 Canadian municipalities and five in Newfoundland. R Pop. (Relationship Population): The cumulative population of all of the municipalities that are dependent on the municipality around the year 1900. If there were no municipalities dependent then the morphological population will be identical to the municipality proper's population. No morphological population figure will be displayed for municipalities which are dependent. When it comes to municipalities of similar size (and typically amalgamated as a new entity), the morphological population will be stated only for the municipality that had the most people. 2° Admin. Cap (Secondary Administrative Division Capital): If the municipality is the seat or capital of the secondary administrative division (i.e., county, district, or parish [Louisiana]) that it is located in a "Yes" is displayed. In Australia, there are counties used for division purposes but they do not have any political function and thus no capital so I indicate if it was the "largest" in the county. 1° Admin. Cap. (Primary Administrative Division Capital): If the municipality is the capital of the primary administrative division (i.e., state, province, territory, etc.) that it is located in a "yes" is displayed. Constituency Cap. (Constituency Capital): If the municipality is the capital of the constituency that it is located in (i.e., England, Wales, Scotland, Ireland, Jersey, Guernsey and the Isle of Man) a "yes" is displayed. 2° Political Cap. (Political Capital): If the municipality is the capital of the political entity (i.e., country, dominion, or colony) that it is located in a "yes" is displayed. Note: London, England takes precedent over colonial and dominion capitals. # in 2° Admin. (Number in Secondary Administrative Division): The municipality's population rank relative to the other municipalities found within the same secondary administrative division (i.e., county, district, or parish [Louisiana]). Total in 2° Admin. 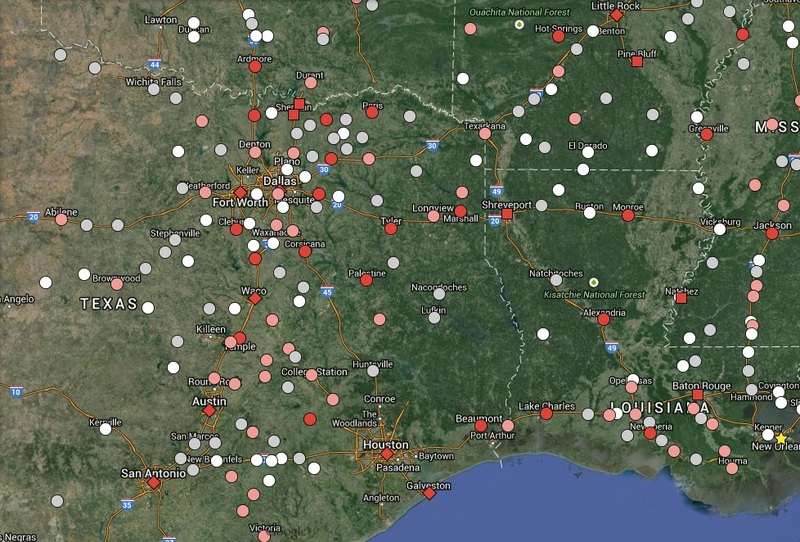 (Total in Secondary Administrative Division): The total number of municipalities found in the same secondary administrative division (i.e., county, district, or parish [Louisiana]). # 1° Admin. (Number in Primary Administrative Division): The municipality's population rank relative to the other municipalities found within the same primary administrative division (i.e., state, province, territory, etc.). Total 1° Admin. (Total in Primary Administrative Division): The total number of municipalities found in the same primary administrative division (i.e., state, province, territory, etc.). Total in Constituency: The total number of municipalities found in the same constituency (i.e., England, Wales, Scotland, Ireland, Jersey, Guernsey and the Isle of Man). # in 2° Political Entity (Number Secondary in Political Entity): The municipality's population rank relative to the other municipalities found within the same primary political entity (i.e., country, dominion, or colony). Total in 2° Political Entity (Total in Secondary Political Entity): The total number of municipalities found in the same political entity (i.e., country, dominion, or colony). # in 1° Political Entity (Number in Primary Political Entity): The municipality's population rank relative to the other municipalities found within the same primary political entity. i.e., the DES British Empire or the American Empire (completely informal entity). Total in 1° Political Entity (Total in Primary Political Entity): The total number of municipalities found in the same political entity (i.e., country, dominion, or colony). # in DES British Empire (Number in Developed English Speaking British Empire): The municipality's population rank relative to the other municipalities found within the developed English speaking British Empire. Total in DES British Empire (Total in Developed English Speaking British Empire): The total number of municipalities found in the developed English speaking British Empire. Region: The name of the region that the municipality is found in (i.e., North America, British Isles, or Oceania). # in Region (Number in Region): The municipality's population rank relative to the other municipalities in this article located in the same region (i.e., Africa, British Isles, North America, or Oceania). Total in Region: The total number of municipalities found in the region (i.e., Africa, British Isles, North America, or Oceania). Rail Companies: Which rail companies provided service to the municipality . Each number corresponds to a rail company name in the table in section 4.3. Great Lakes Waterway: If the municipality is in some way connected to the Great Lakes and Saint Lawrence River by a navigable route, a "Yes" is displayed. In 1900 the Mississippi River was connected connected to the Great Lakes by at least one operational canal that ran southwest from Chicago meaning that if you're connected to one you have a navigable water route to the other. Despite this I only indicate one or the other with the exception of those municipalities actually situated along the canals that connected the Great Lakes and the Mississippi transportation routes. The exact date some canals were completely nonoperational is vague so it is difficult to determine whether or not a number of municipalities still had access to water transportation as this mode had been phased out by the competition of rail . Mississippi River: If the municipality is in some way (other than the exception stated above) connected to the Mississippi River by a navigable route a "Yes" is displayed. The following abbreviations are used in the primary data table. Below is a key for railway companies column found in the primary data table. In this section is one interactive table and four interactive Google Maps. The table has its own independent scroll bars on the bottom and on the right of its interface. You can use them to navigate from column to column and row to row. You can also click on the different headers to sort by them. When you click on an icon it will display the corresponding municipality's population and rank. Since initially making the map I've updated the ranking so it might be a little bit off the further you go down. The table is the most reliable source. There's a full screen option on the map in the upper right of its interface, that version has a search bar that you can use to search for any of the municipalities. On this version you may also be able to enable and disable map layers that represent different population ranges depending on the map selected. North America: Google Street View Enabled Version (Unstable, reverts to normal map frequently). 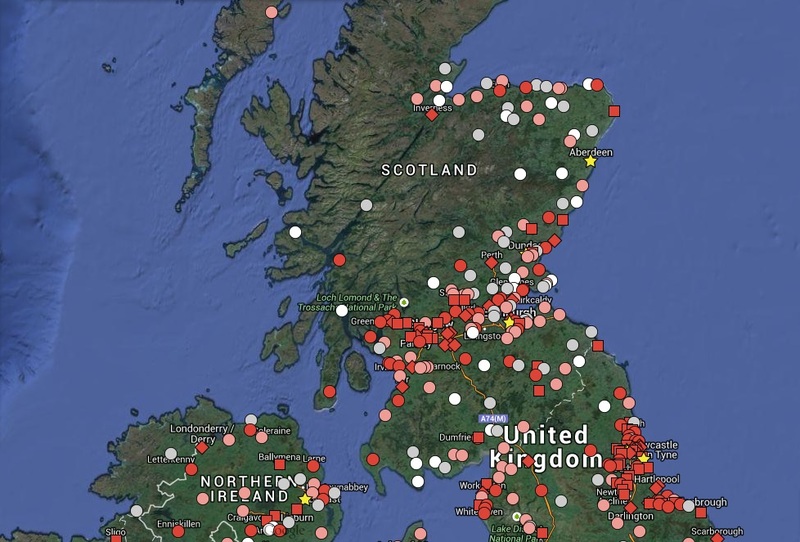 British Isles: Google Street View Enabled Version (Unstable, reverts to normal map frequently). 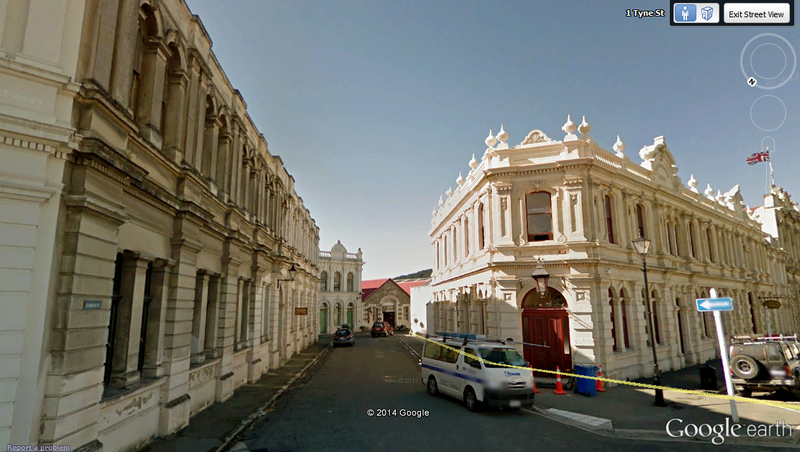 Oceania: Google Street View Enabled Version (Unstable, reverts to normal map frequently). Southern Africa: Google Street View Enabled Version (Unstable, reverts to normal map frequently). - NOTE: For an unknown reason, only 100 rows are showing up at any given time in the table below. Within this article there were in total, 67,863,817 people who lived in one of the 5,972 municipalities. The total number of people in all of these political entities combined adds up to 134,430,253, meaning that 50.5% of the population lived within a municipality. The cumulative population of all of the municipalities divided by two is 33,929,772 which is roughly the same population as the top 136 most populated municipalities combined. The average population for a municipality is 11,362. It's interesting to look at the data, how populated San Francisco, a west coast municipality was. Buffalo was all the way up at the 8th largest city in 1900 and today it only has 261,310 inhabitants. It's not just that some cities have lost population, but their character has also changed largely in that people enjoy living in the suburbs. The metropolitan population of Buffalo today is actually 1,135,509 people. Below are three tables. The first table compares the four different regions in this article, the second, compares all of the political entities, and the third compares all of the administrative divisions. In the third table, for the political entities that are found in southern Africa, both a total and white-only population are included for a comparison. Another exception in this table is that there are no administrative divisions included for Africa. This is because the colonies that would become administrative divisions in the future weren't united until the Union of South Africa in 1910 (this exception also applies for Newfoundland's relationship with Canada). When looking at the distribution of the white population in southern Africa in the table above, it appears to be pretty clear that the white population tended to build and live in urban centres. An interesting thing to note is that although the county of London, England only contains one municipality, which it happens to be conterminous with, it ranks as the fourth most populated primary administrative division out of all of the DESW. Below is a chart displaying every municipality analyzed in this article that contained more than 100,000 inhabitants around the year 1900. Rank by Pop. : The rank by total administrative division population. Rank by # of Municipalities >1,000:The rank by the number of municipalities with more than 1,000 inhabitants located within the secondary administrative division. Rank by Inc. Pop. >1,000: The rank by the cumulative population of all municipalities with more than 1,000 inhabitants located within the secondary administrative division. 2° Admin. : The name of the secondary administrative division. AD: "Administrative designation", meaning what the secondary administrative division is referred to as. e.g., County, Parish (used in Louisiana), City (meaning the city is independent of any surrounding secondary administrative division government), Indian Reserve, Nation, or Park Reserve (Yellowstone National Park). 1° Admin. : The name of the primary administrative division that the secondary administrative division is located in. Established: The year that the secondary administrative division was established. 2° Admin. Pop. : The population of the secondary administrative division in the year 1900. Area (km2): The area of the secondary administrative division in kilometres cubed. Density (km3): The density of the secondary administrative division. 2° Admin. Cap. : The name of the capital (typically referred to as a "seat") of the secondary administrative division. Cap. Population: The population of the capital of the secondary administrative division. Many times the seat itself wasn't incorporated in 1900, thus nothing may be stated for many municipalities in this column. # Municipalities >1,000: The number of municipalities with more than 1,000 inhabitants found within the secondary administrative division in the year 1900. Sum: The sum of all of the municipalities with more than 1,000 inhabitants found within the secondary administrative division in the year 1900. % Urban: The percent of the secondary administrative division that was urban given the condition of having to be within a municipality above the 1,000 inhabitants threshold. Etymology: This column looks at the source of the secondary administrative division's name. It only focuses on those that were named after people. It is interesting to note that secondary administrative divisions in the Midwest almost always contain a municipality with more than 1,000 inhabitants. Some in Texas hold very few inhabitants with Bailey as few as 4. Many times those with such low populations do not possess seats of government. Below is a table listing the names of all of the people who had secondary administrative divisions named after them in the United States in the year 1900. The following is a series of screenshots from the interactive Google map. Each screenshot has the same field of view to allow for comparison. The states of New York, Pennsylvania, and Ohio along with surrounding areas. Note the corridors of municipalities radiating outwards from Pittsburgh along the industrialized river valleys. The American Midwestern states of Ohio, Indiana, and Illinois along with the populated southern portions of Wisconsin and the Lower Peninsula of Michigan. St. Louis, Missouri is visible in the lower left too. Note the corridors of municipalities that followed railway lines particularly in Illinois. Chicago's streetcar suburbs are also apparent. Eastern Texas and Louisiana along with some surrounding states. All of Wales, the majority of England, and the south eastern portion of Ireland. Note the dense clusters of municipalities around London, south Wales, and Liverpool, Manchester, Leeds, and Sheffield, continuing to an extent down through Nottingham, Derby, Leicester, and over to Birmingham. Northern England, the majority of Scotland, and northern Ireland. Southern New South Wales and Victoria, Australia. The southern portion of Western Australia which contains the majority of the population along with the capital, Perth. The southern portion of the North Island of New Zealand along with the northern part of its South Island. Two of New Zealand's most prominent urban areas are visible; Christchurch on the South Island and the capital Wellington on the North Island. Basutoland (Lesotho), Natal, Orange River, Swaziland, Transvaal, and Zululand all in the area of northeastern South Africa. Ireland has a similar density to the denser areas found in North America. Perhaps one of the most noticeable observations of all is just how few municipalities are present in the western half of the United States compared to the eastern half as can be seen in the figure below. Another visible trend can be seen in the state of Utah where municipalities seemingly make a path across the state. Also quite noticeable is the aggregation of municipalities along interior valley regions among the Pacific coast states. The following are do not all possess the same field of view. A screenshot of the Western United States and the populated parts of Western Canada from the interactive Google map found in this article. The southern portion of the United States is noticeably less dense in municipalities as seen below. Some areas appearing completely absent of them particularly the Mark Twain National Forest (upper left in the figure below), many parts of West Virginia, and parts of Kentucky and Tennessee. Another noticeable trend is the lack of municipalities present along the Atlantic coast especially compared to those that are among the inland areas of those coastal states. There is also a very prominent north-south corridor visible in the state of Mississippi near the bottom middle of the image below. Also, the municipalities in Texas and Oklahoma Territory seemingly make a column that supports Kansas. The area around Joplin in the far southwestern portion of Missouri is also interesting in its density of municipalities. A screenshot of the general area of the American south from the interactive Google map found in this article. Waterways are a common physical geographical feature that urban areas are frequently found along. The Erie Canal (now known as the New York State Barge Canal System) is a very prominent feature on the map when only the municipalities with more than 5,000+ inhabitants layer is enabled. 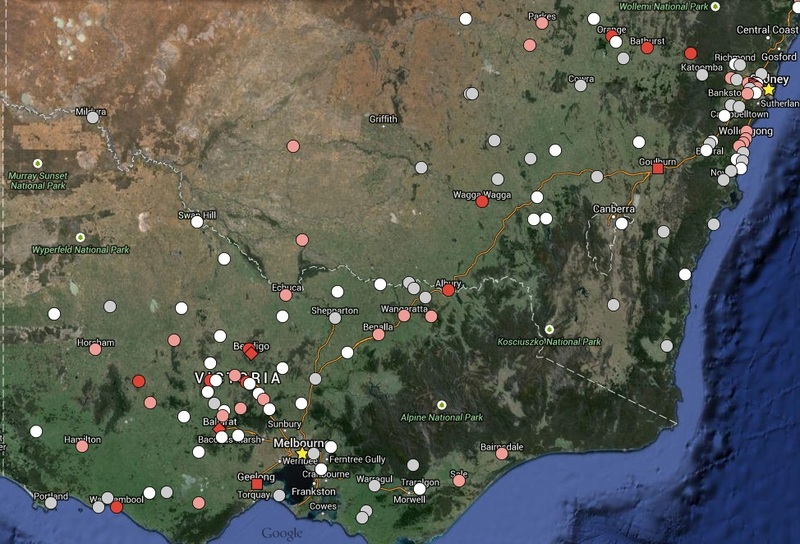 A screenshot of the interactive Google map found in this article with only the 5,000+ inhabitants layer enabled. The Erie Canal has been highlighted in yellow. 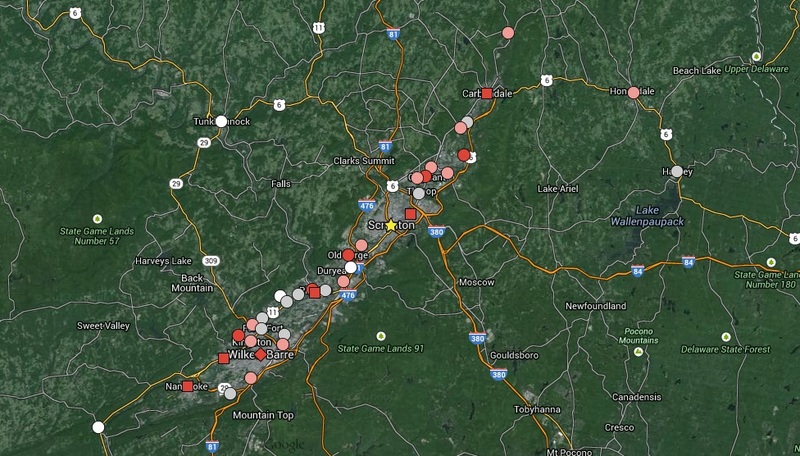 The Lackawanna River Valley around Scranton, Pennsylvania possesses a very noticeable trend as well. The valley is known for its coal mining and there were many municipalities all along the valley especially between Carbondale and Nanticoke. When all of the populations of these municipalities between the aforementioned are added together it comes to 303,611 inhabitants distributed between 33 formally incorporated municipalities. 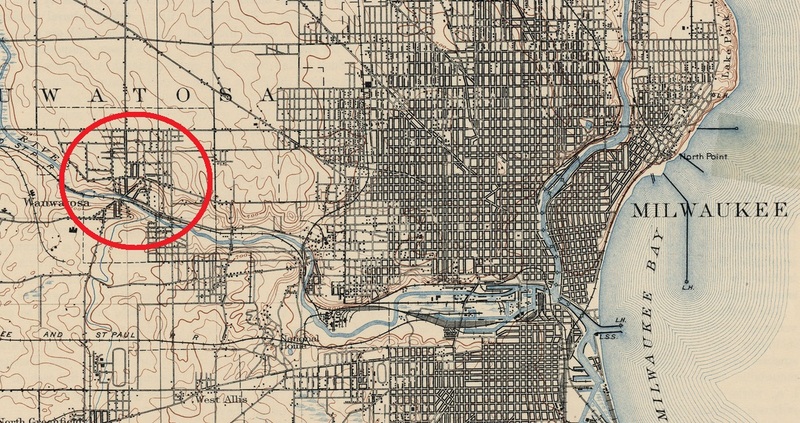 A screenshot of the Lackawanna River Valley from the interactive Google map found in this article. Among the places being referred to as the DESW in this article there are a number of similarities regarding their architecture. For one, since English is the language of the privileged class, much of the terminology used to describe 19th century styles is similar although there are many vernacular variations too. 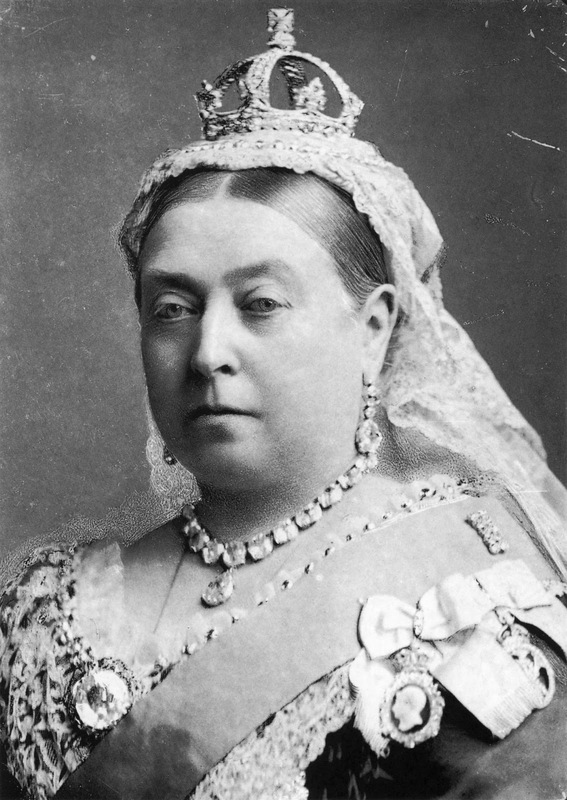 For example, among all of these places the term "Victorian" (refers the British monarch at the time) might be used to describe many eclectic styles that came to prominence during the late 19th century. In the areas not controlled by the United States (since the term "Federalist" is used there instead) the term "Regency" might also be commonly used to described the styles of architecture built under the reign of the Prince Regent (King George IV of the United Kingdom). In areas that had British settlement before 1860 the term "Georgian" may be used to describe British derived architecture in the United States before the War of Independence and in the rest of the British Empire up until 1860 when the styles that propagated under the reigns of a successive line of monarchs named George gave away to the more eclectic stylings of the Victorian era. Through all of this, many of these styles can also be witnessed in places not analyzed in this article due to both the vastness of the British Empire and the United States' control and also their hegemonic power. Pediments: In original Greek architecture a pediment was a triangular ornament that sat on top of the entablature (the superstructure between the tops of the columns and the pediment). On the buildings shown in this article, pediments can also come in the form of "curved", "broken", and "open". Columns/Pilasters: Vertical motifs with a base and topped with a capital. These are typically found between windows and around doors. The can be freestanding or bas-relief. Many times there will be a portico attached to the fronts of prominent buildings that is composed of columns supporting a pediment. Cornices: Horizontal ledges that protrude outwards from the façade (in classical architecture it was the topmost element of the entablature). Most commonly found along the roof line (where it would likely be the most prominent ledge on the entire façade) but also commonly found visually dividing each storey. Dentils: Tooth-like blocks under the cornices. Quoining: Blocks on the corners and around windows. 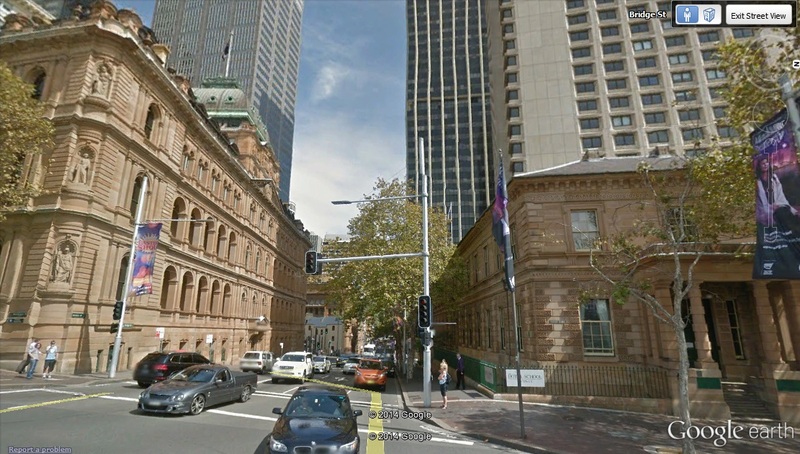 On the left is the Chief Secretary's Building, Sydney, Australia (487,932 inhabitants in 1901). Built 1873-1880. Explore on Google Street View. 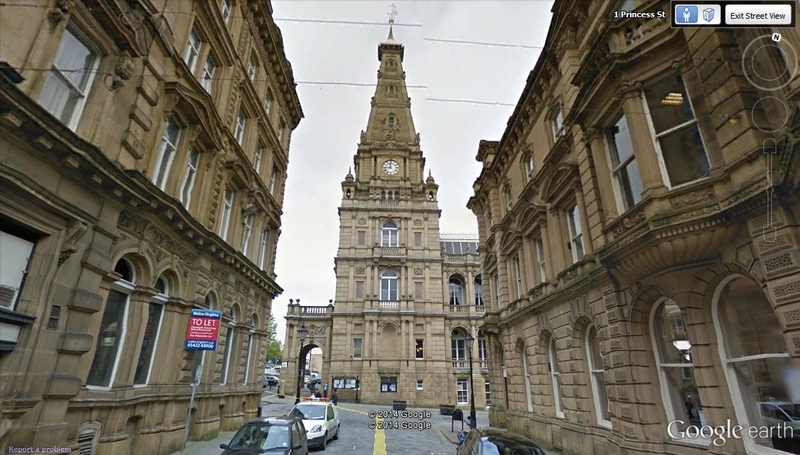 At the end of the street is the Halifax Town Hall built 1861-1863. Halifax, England, United Kingdom (104,933 inhabitants in 1901). Explore on Google Street View. The Dominion Building used as Halifax, Nova Scotia's (40,832 inhabitants in 1901) central post office. Built 1867. Explore on Google Street View. 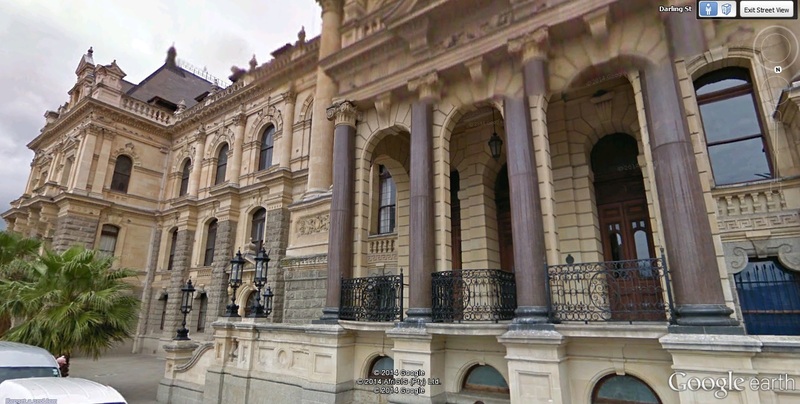 Cape Town's city hall, finished in 1905, although technically of the Edwardian era, bears a strong resemblance to the other architecture in this subsection. The urban area was home to 169,641 inhabitants in 1904. Explore on Google Street View. 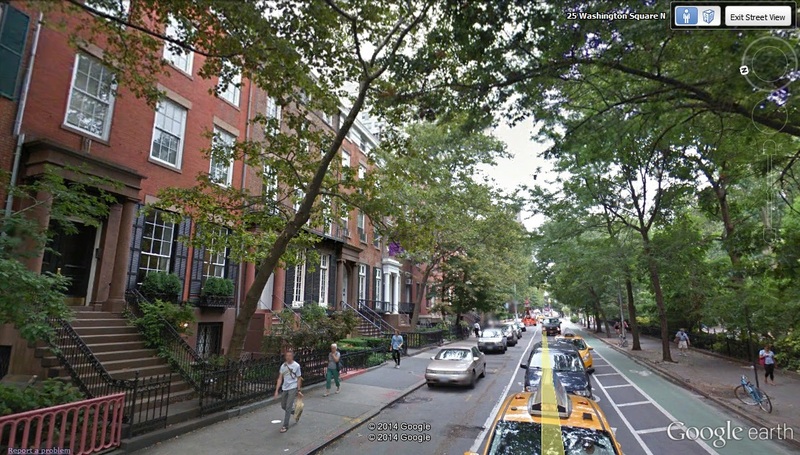 Brownstone terraced housing in Harlem, New York City (3,437,202 inhabitants in 1900) Explore on Google Street View. 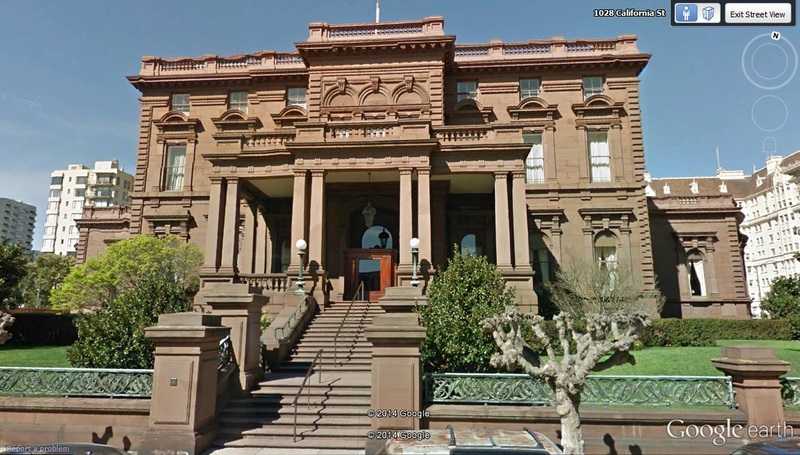 The James C. Flood Mansion, better known as the Pacific-Union Club in San Francisco, California (342,782 inhabitants in 1900). It was built in 1886 from brownstone that was quarried in Connecticut and shipped around Cape Horn to the other side of the Americas. It amazingly survived the 1906 San Francisco earthquake and fire. Explore on Google Street View. 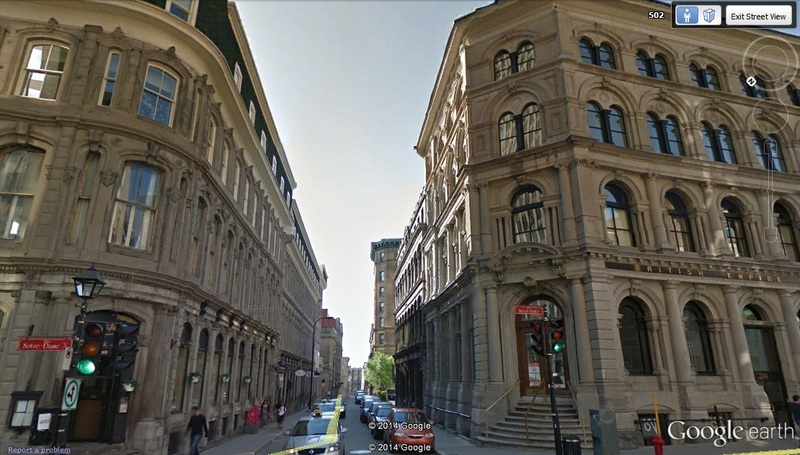 On the right is the British Empire Building in Montreal, Quebec (267,730 inhabitants in 1901). It was built in 1874. Explore on Google Street View. 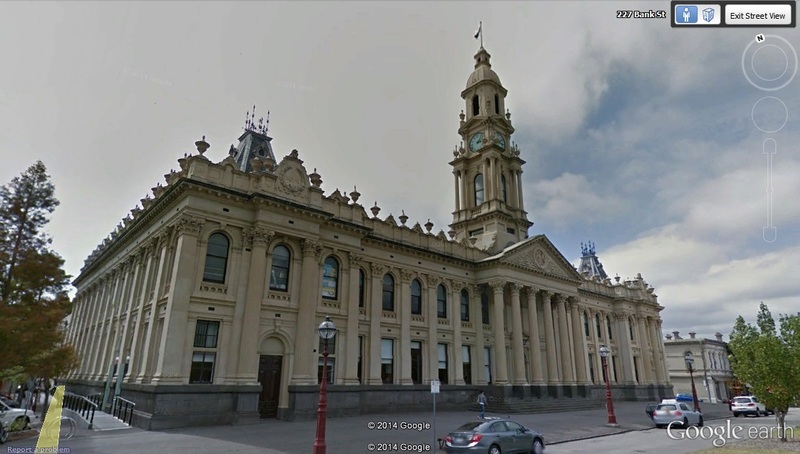 Victorian limestone commercial buildings in Oamaru, New Zealand (4,800 inhabitants in 1901). To the right is the Criterion Hotel, built 1877. To the extreme right with a British flag on top is Smith's Grain Store, built 1882. Explore on Google Street View. One of the most common repeating elements to look for in this comparison are the clock towers. 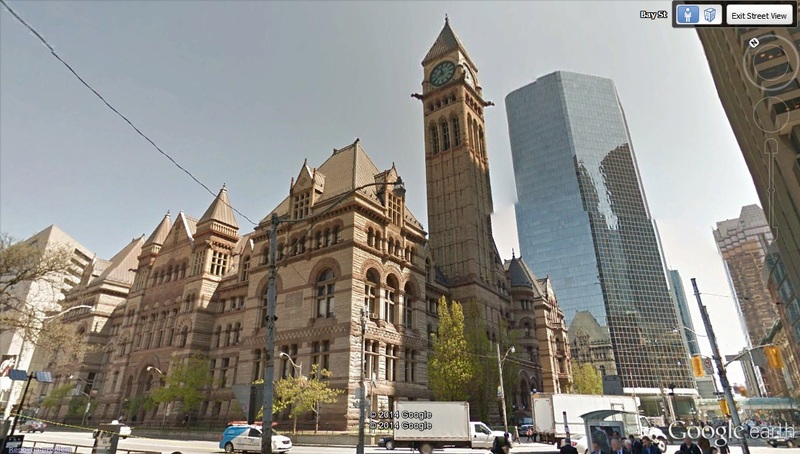 Richardsonian Romanesque was a popular style during the Victorian Era, Toronto's Old City Hall being an example below. All of the buildings share an imposing appearance. Toronto, Ontario's (208,040 inhabitants in 1901) Old City Hall built 1889-1899 in the Richardsonian Romanesque style. When it was completed it was the largest municipal building in North America. Explore on Google Street View. 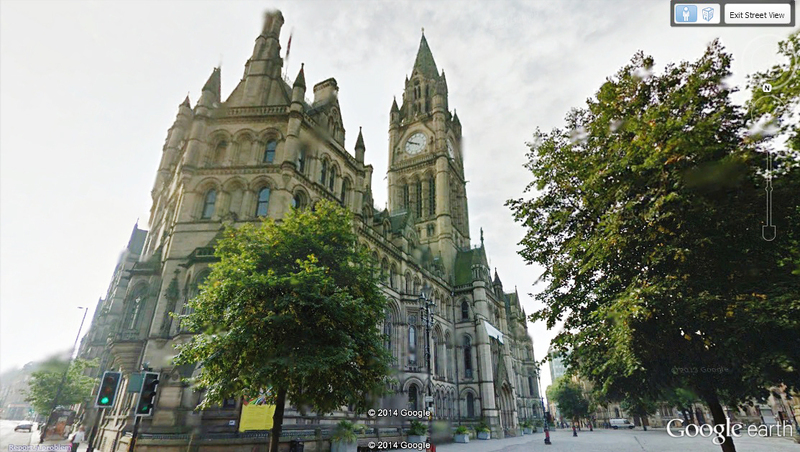 Manchester, England's (543,969 inhabitants in 1901) town hall built 1868-1877, it is considered to be one of the finest Victorian and Gothic-Revival buildings ever built. Explore on Google Street View. South Melbourne, Australia's town hall built 1879-1880 and is regarded as the grandest expression of Victorian Second Empire styling to be found in Australia. Explore on Google Street View. 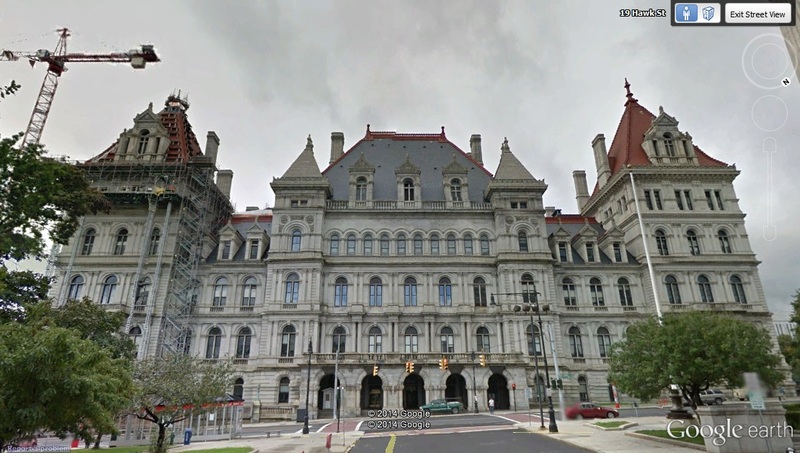 The New York State Capitol Building in Albany New York (94,151 inhabitants in 1900). It was built between 1867-1890 at a cost of $25 million (half a billion today). Explore on Google Street View. Simplicity wouldn't be a surprise to find among the architecture of the Victorian working classes. Still, some examples do possess ornamentation, especially tenement buildings like the ones found in New York City. The working class housing arguably shows the most diversity between regions, where even within Britain tenements are more commonly found in Scotland and terraced housing in England. In Australia, New Zealand, and the areas of South Africa differ in that there is a higher prevalence of verandas, likely due to the warmer climate. Working class construction also tends to take on more vernacular styling since its more likely to utilize what materials are readily available and whatever methods of construction are the simplest. Below is a series of images illustrating worker's terraces found among the places analyzed in this article. 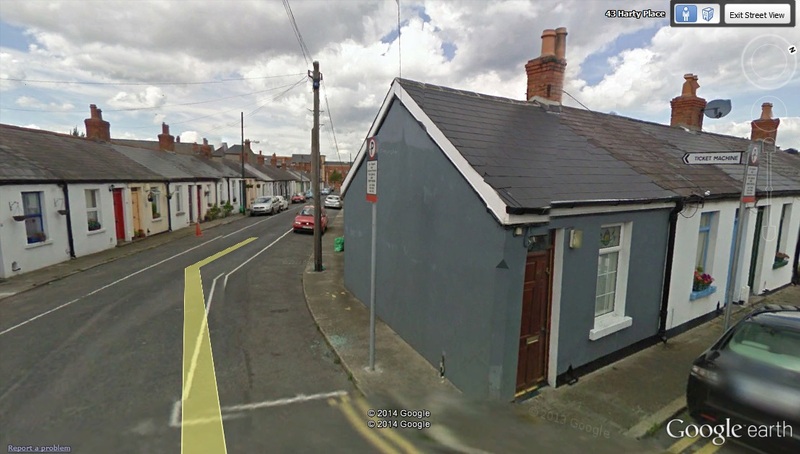 Working class terraced housing in Dublin, Ireland, home to 290,600 inhabitants in 1901. Explore on Google Street View. 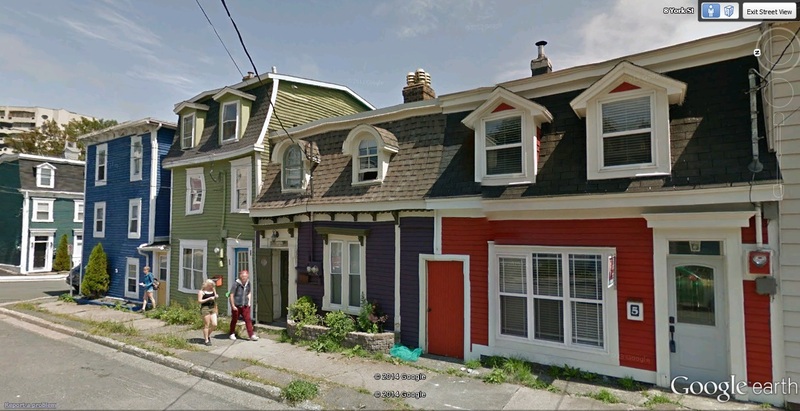 Terraced houses in St. John's, Newfoundland which is now part of Canada. It was home to 29,594 inhabitants in 1901. Explore on Google Street View. 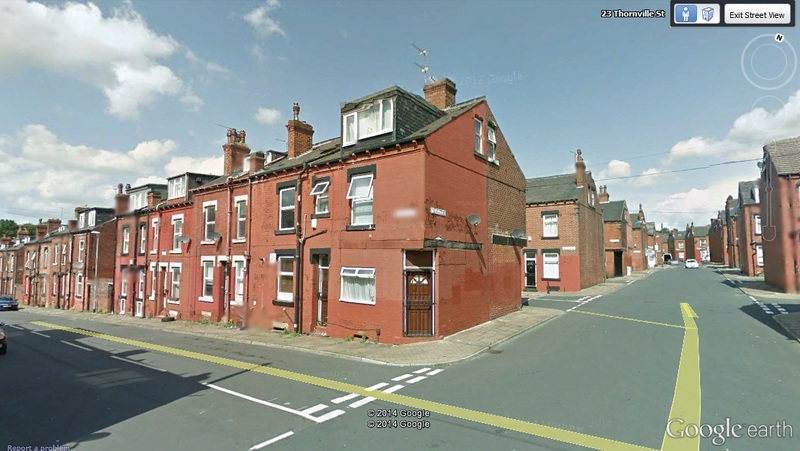 Working class housing in Leeds, England, home to 428,953 inhabitants in 1901. Explore on Google Street View. 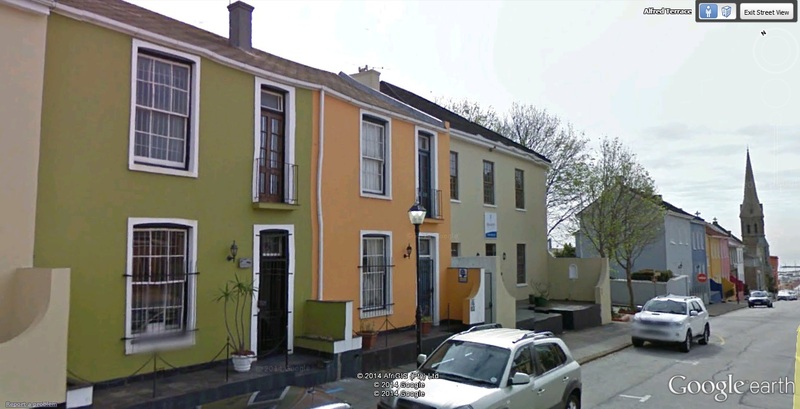 19th century terraced houses in Port Elizabeth, Natal (South Africa), home to 32,959 inhabitants in 1904. Explore on Google Street View. The Victorian working class neighbourhood of Pointe-Saint-Charles in Montreal, Quebec, home to 267,730 inhabitants in 1901. Explore on Google Street View. 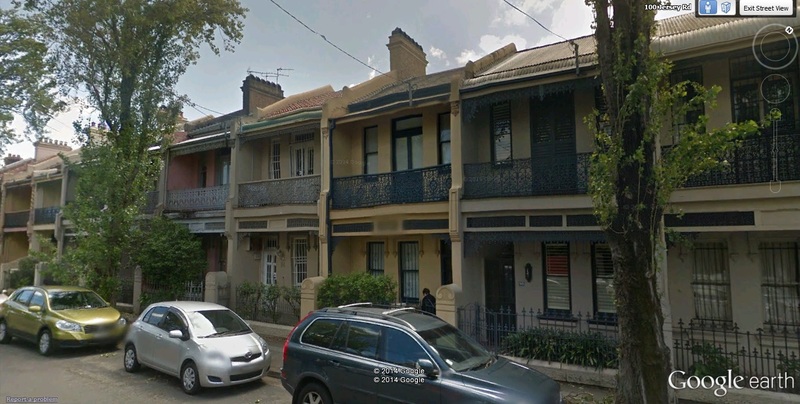 Victorian era working class terraced housing in Glebe, Sydney, Australia, home to 487,932 inhabitants in 1901. One thing to note throughout these images is how common verandas are in warmer climates like southern Africa, Australia, and the Southern United States. Explore on Google Street View. Terraced housing in Cape Town, Cape of Good Hope colony which is now part of South Africa. It was home to 169,641 inhabitants in 1904. 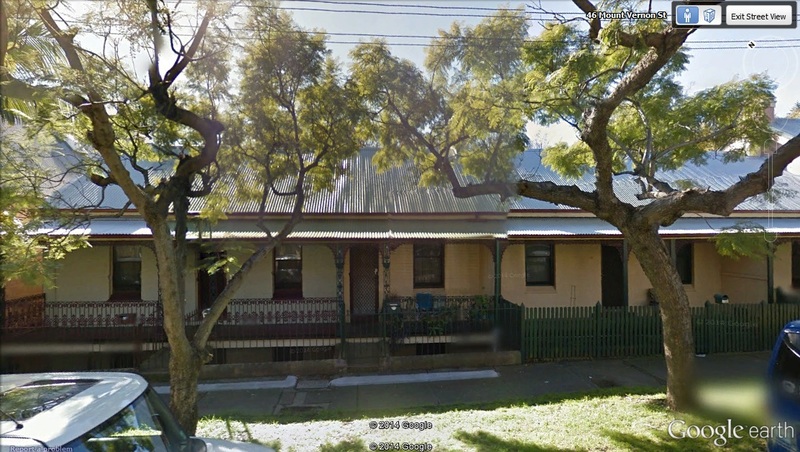 Compare to the low profile and verandas of Sydney's terraced housing above. Note that both have mental roofs . Explore on Google Street View. 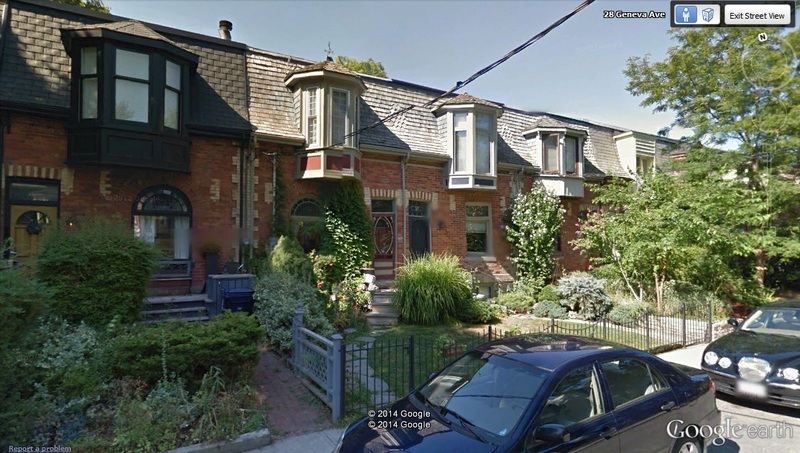 Victorian terraced houses, Toronto, Ontario, home to 208,040 inhabitants in 1901. Explore on Google Street View. Below are two examples of middle class terraced housing. One is from Cape Town in southern Africa and the other is from Sydney, Australia. Note the great similarities in the iron crested balconies and the recessed verandas and balconies. Terraced housing in Cape Town, Cape of Good Hope colony, which is now part of South Africa. 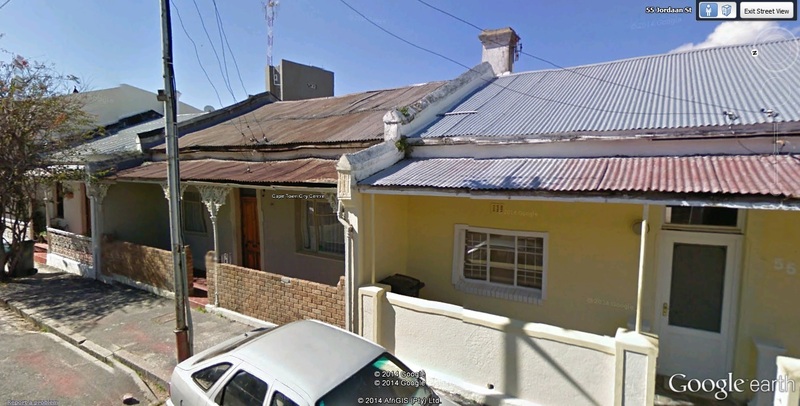 In 1904 it was home to 169,641 inhabitants in 1904. home to Explore on Google Street View. Terrace housing in Sydney, Australia, home to 481,830 inhabitants in 1901. Explore on Google Street View. It is noticeable that each region has its own vernacular take on terraced housing. Another type of housing that was common among the working classes was the Victorian cottage. Below are examples found among the places analyzed in this article. 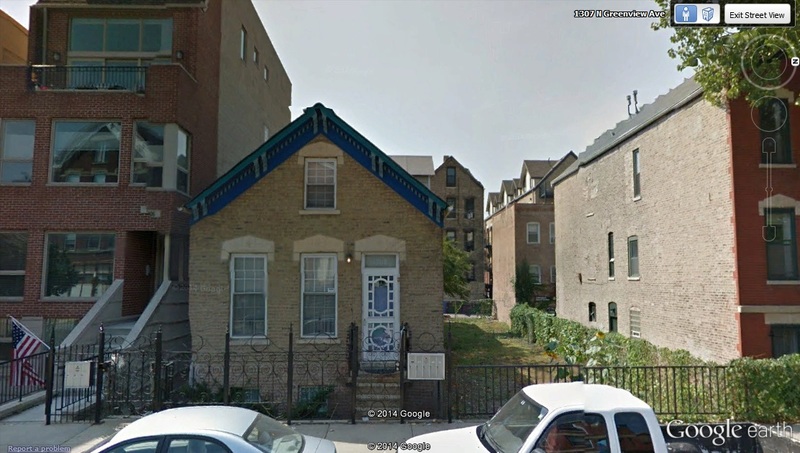 A small working class cottage with a blue cornice in Chicago, Illinois, home to 1,698,575 inhabitants in 1900. Explore on Google Street View. 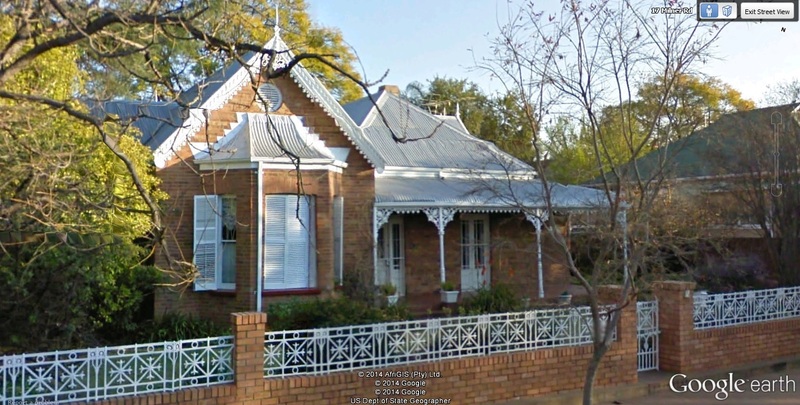 A Victorian house in Kimberley, Cape of Good Hope colony, which is now part of South Africa. In 1904 it was home to 43,709 inhabitants. Explore on Google Street View. 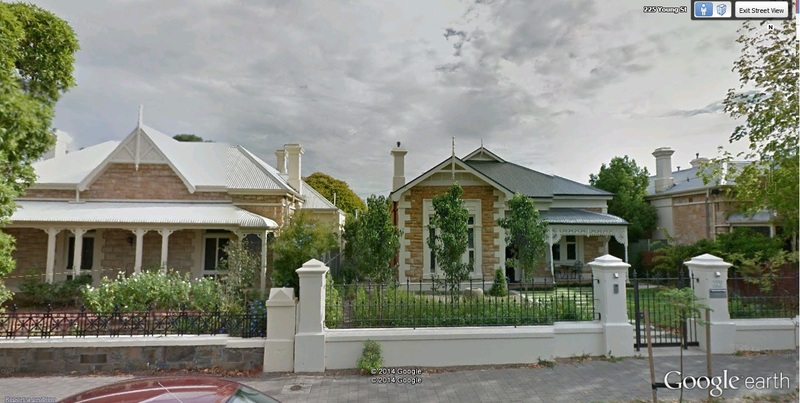 A few Victorian houses in Adelaide, Australia. Notice the similarities between the house on the middle right to Kimberley in the example above namely, the overall "L-shape" and the veranda occupying the recessed portion of the front. Explore on Google Street View. 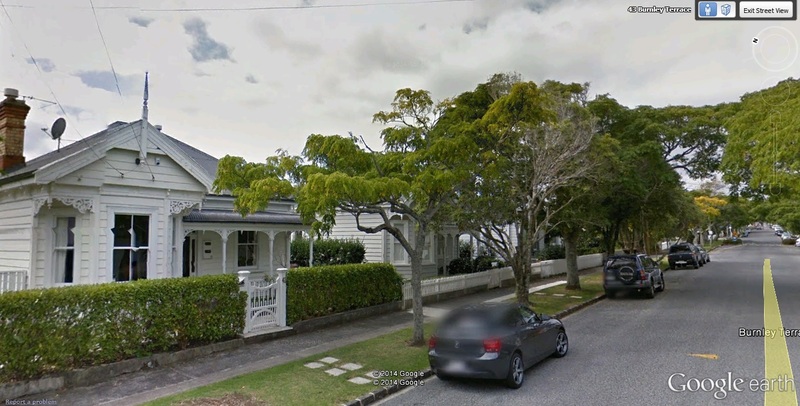 A Victorian cottage in Auckland, New Zealand, home to 67,226 inhabitants in 1901. Notice the similarities in the overall "L-shape" of the house and the veranda occupying the recessed portion of the front as with the previous two examples. Explore on Google Street View. Below are the aforementioned examples of tenement housing that can be found most commonly in Edinburgh and New York City. 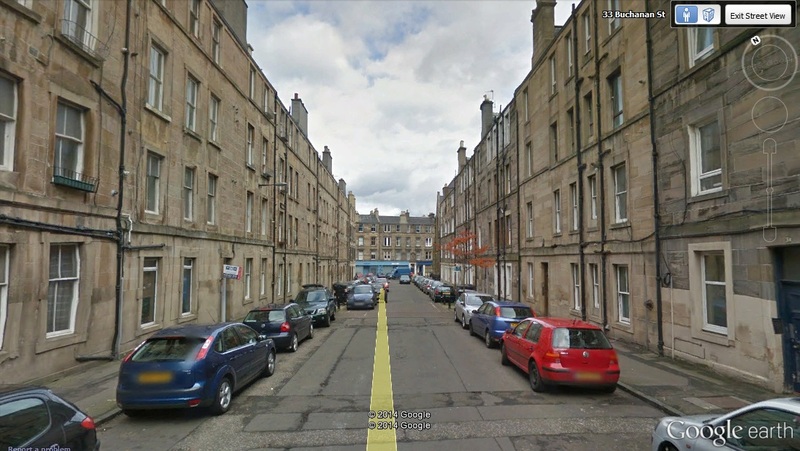 Tenements in Edinburgh, Scotland, home to 304,800 inhabitants in 1901. Explore on Google Street View. 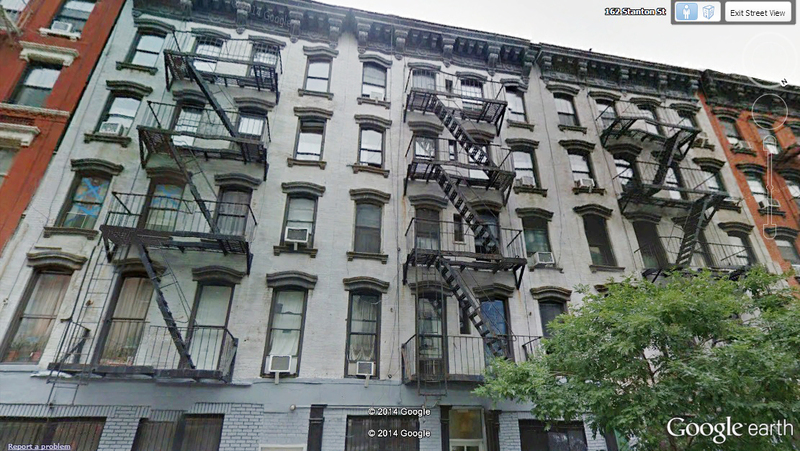 Victorian tenement buildings in Lower East Side, New York City, home to 3,437,202 inhabitants in 1900. View on Google Street View. The architecture of the wealthy classes in the Victorian era takes on more of the styling of the public buildings popular at the time. When it came to public buildings there would be a larger budget to work with meaning that the buildings could more easily be constructed in whatever was considered to be the height of fashion at the time. Similarly, the architecture of the wealthy classes also was built on a large budget and typically in what fashion was at its height at the time. It is because of this that the architecture of the extremely wealthy during this era can be easily confused with public buildings. In a sense, it's a compliment towards the owner's incredible wealth and power that such a mistake could be made. 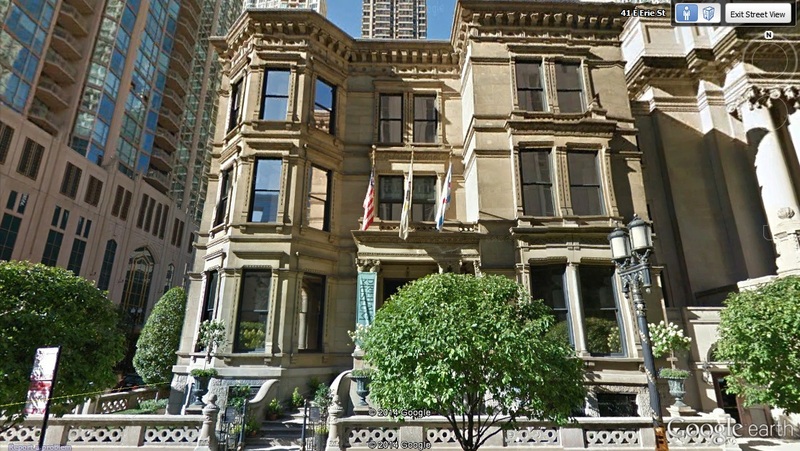 The Nickerson House (Richard H. Driehaus Museum) in Chicago, Illinois (home to 1,698,575 inhabitants in 1901) was constructed in 1883 for banker Samuel Mayo Nickerson. 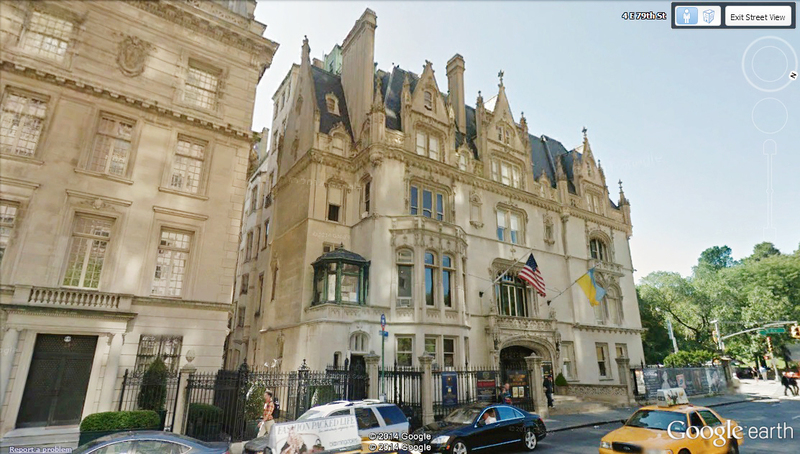 It's an example of an urban Gilded Age American mansion. Explore on Google Street View. The George H. Gooderham house was built in 1892 in Toronto, Ontario (home to 208,040 inhabitants in 1901) for a Manufacturer and politician. Explore on Google Street View. The Harry F. Sinclair (founder of Sinclair Oil) House is located on the corner of Fifth Avenue and Seventy-Ninth Street, New York City (home to 3,437,202 inhabitants in 1900). 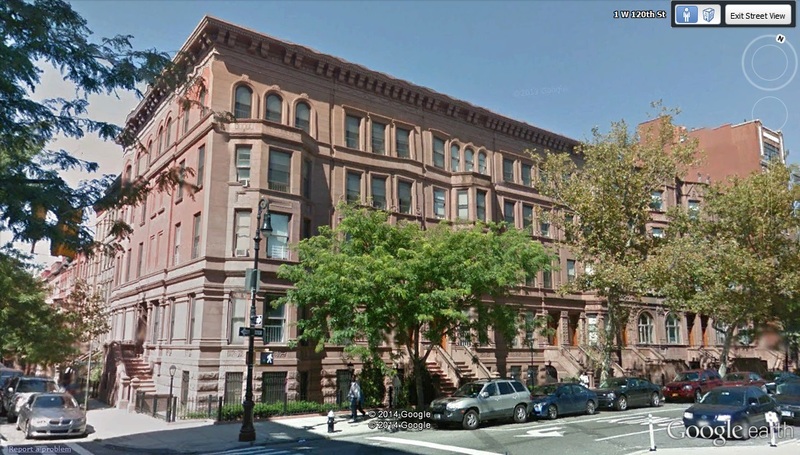 It's a fine Gilded Age mansion which was built between 1897-1899. It was built in a Châteauesque style that was popular during the late Victorian era among the most elite. Explore on Google Street View. The Dunluce or Lillianville House in Kimberley, Cape of Good Hope (South Africa) was built in 1897. 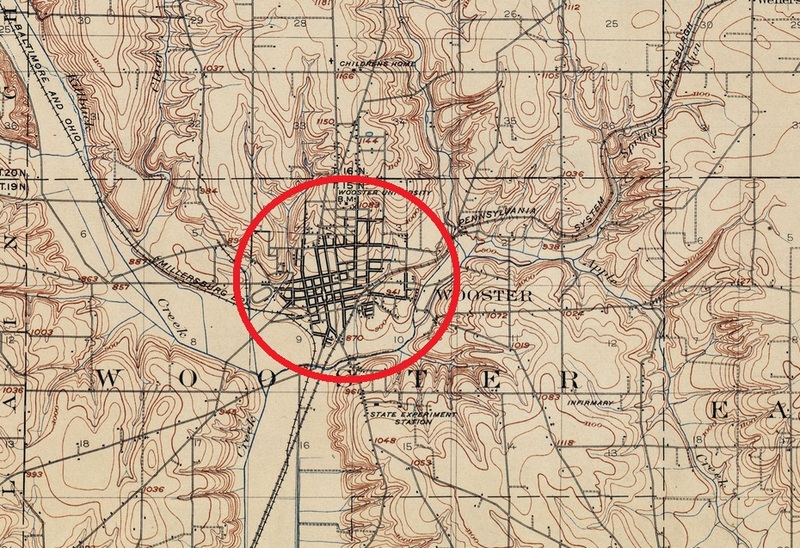 The urban area of Kimberley was home to 43,709 inhabitants in 1904. Explore on Google Street View. 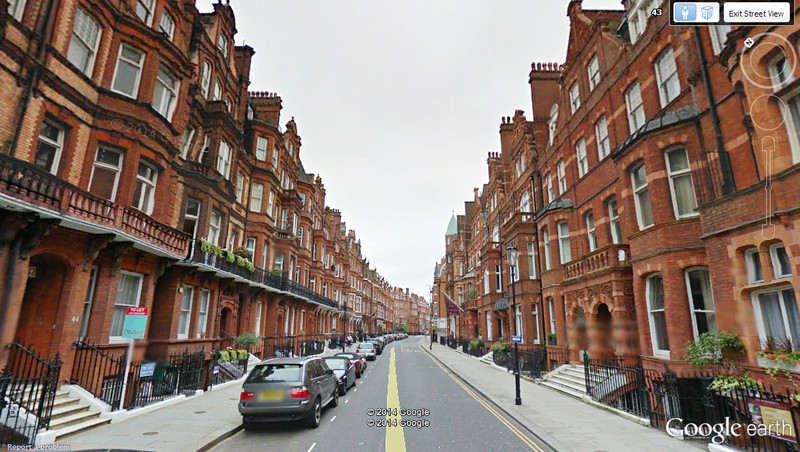 A Victorian terrace lined street in Chelsea, London, England (home to 4,536,541 inhabitants in 1901). Explore on Google Street View. 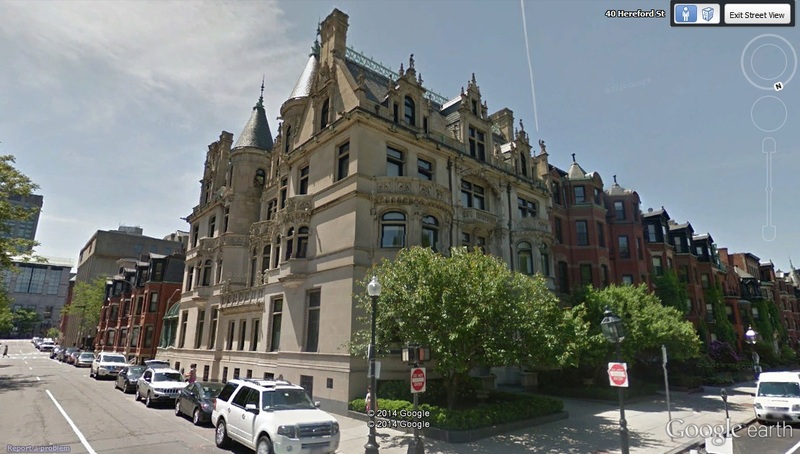 The Burrage Mansion in the Back Bay neighbourhood of Boston, Massachusetts (the city, home to 560,892 inhabitants in 1900) was built in 1899 for Albert C. Burrage who was a lawyer, politician, philanthropist, president of gas light and copper mining companies, had a major role in Standard Oil, and oversaw the construction of the Boston subway. 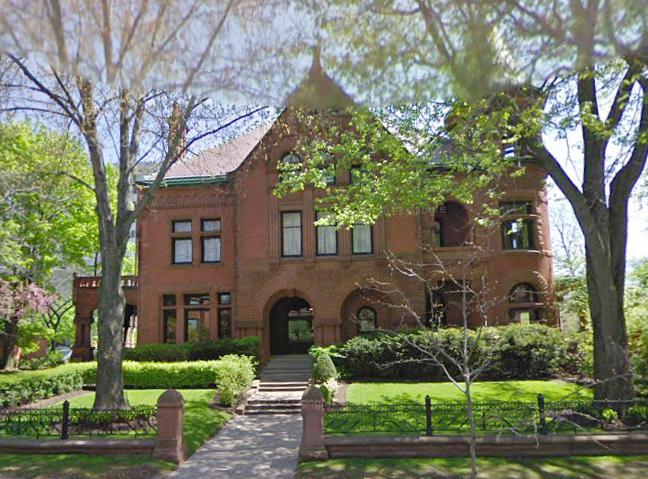 It is also in a Châteauesque style as seen earlier with the Harry F. Sinclair House. Explore on Google Street View. 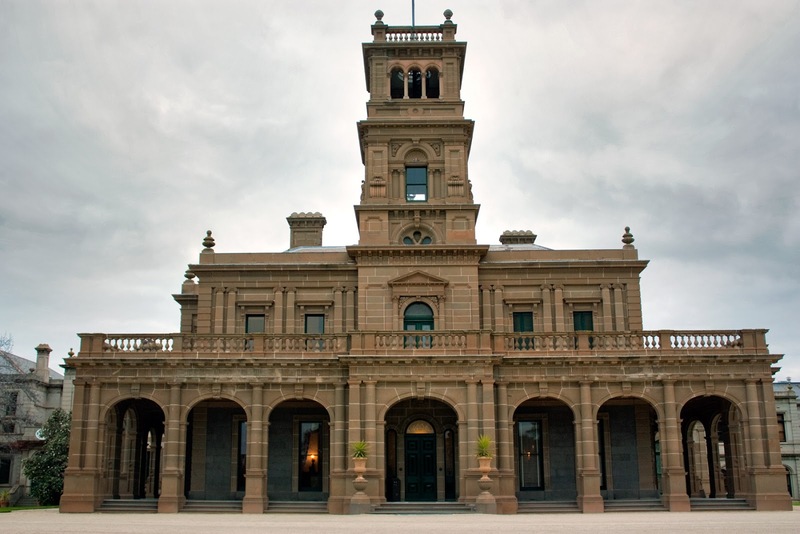 Werribee Park Mansion, near Melbourne, Australia, home to 496,079 inhabitants in 1901. Built between 1874-1877 for wealthy sheep farmers. Image by Rexness via Flickr . 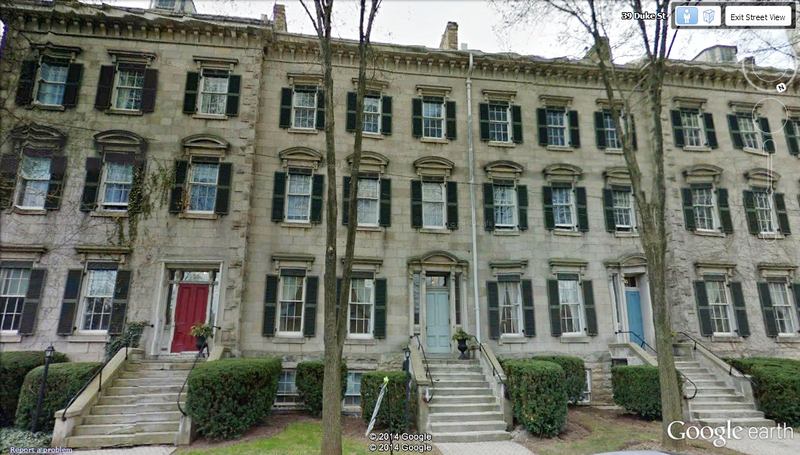 The George Stephen House built in what was known as the elite "Golden Square Mile" of Montreal, Quebec (home to 267,730 inhabitants in 1901) in the nineteenth century. It was erected between 1880-1883 for George Stephen, 1st Baron Mount Stephen, the first Canadian to be elevated into the Peerage of the United Kingdom. He was a major influence behind the Canadian Pacific Railway, was President of the Bank of Montreal, and was one of the most prominent philanthropists of the time. He worked closely with King George V and was considered to be the wealthiest man in Canada. Explore on Google Street View. Although it may sound absurd to some people today, in the Georgian and Victorian eras many of the most wealthy owned an extravagant urban townhouse that would be connected to its neighbours. 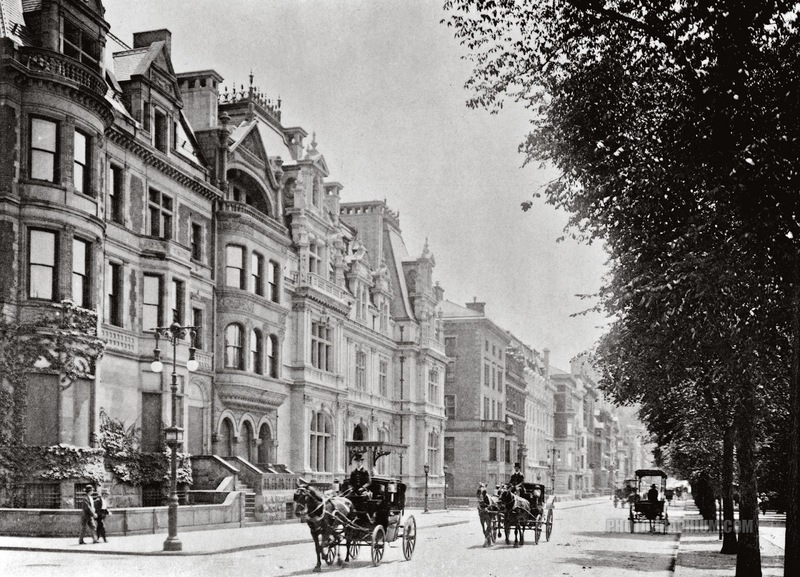 Among the British Isles, "Georgian and Victorian Squares" were some of the most fashionable areas for the wealthy to live. The were composed of a gated landscaped park that would be surrounded on all sides by large terraced townhouses. Although not too many examples were built and still survive outside of Britain, there are some examples or at least remnants in New York City (Washington Square c. 1830; Gramercy Park c. 1850), Boston (Louisburg Square c. 1845; Union Park c. 1850; Chester Square c. 1850; Worcester Square), San Francisco (South Park c. 1855), and Melbourne (St Vincent Gardens c. 1868). The Bute House (centre), is the official residence of the First Minister of Scotland who is the head of the Scottish government. 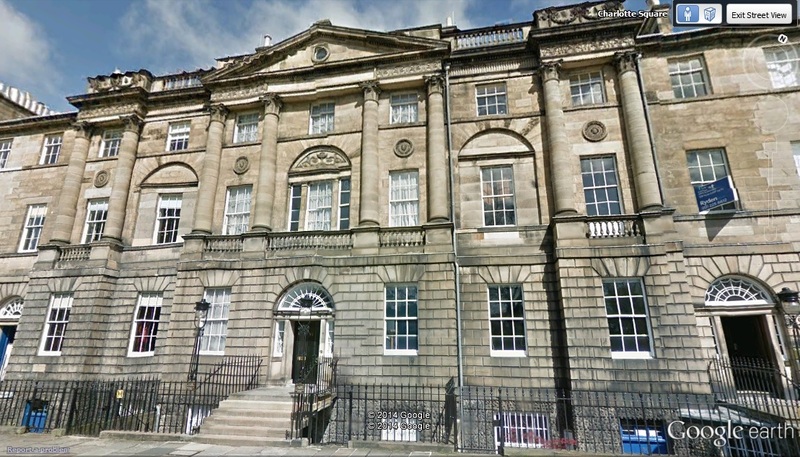 Located at 6 Charlotte Square in Edinburgh, Scotland (304,800) it was built circa 1796. Explore on Google Street View. Sandyford Place townhouses built circa 1856 in Hamilton, Ontario (52,600). Explore on Google Street View. 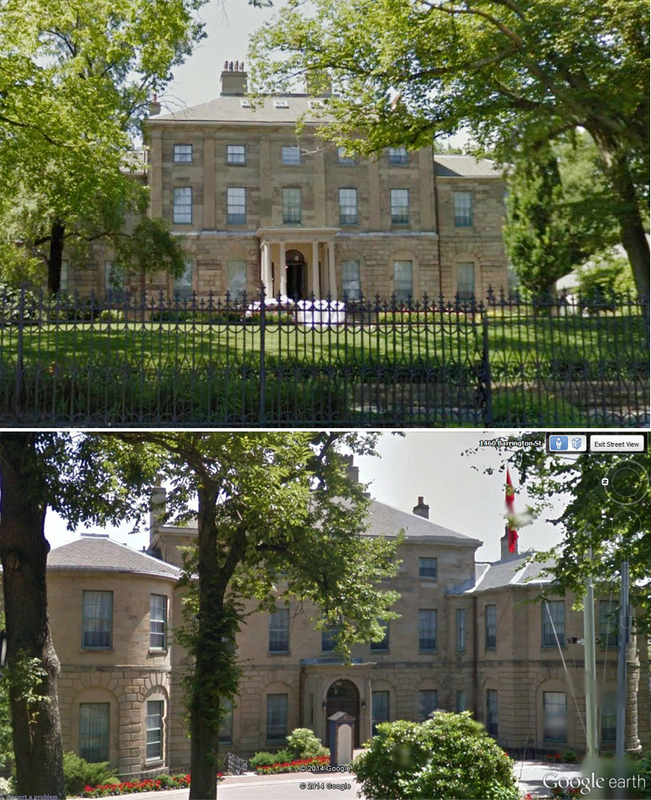 The Government House of Nova Scotia located in Halifax (40,832) (top is the front and the bottom is the reverse). 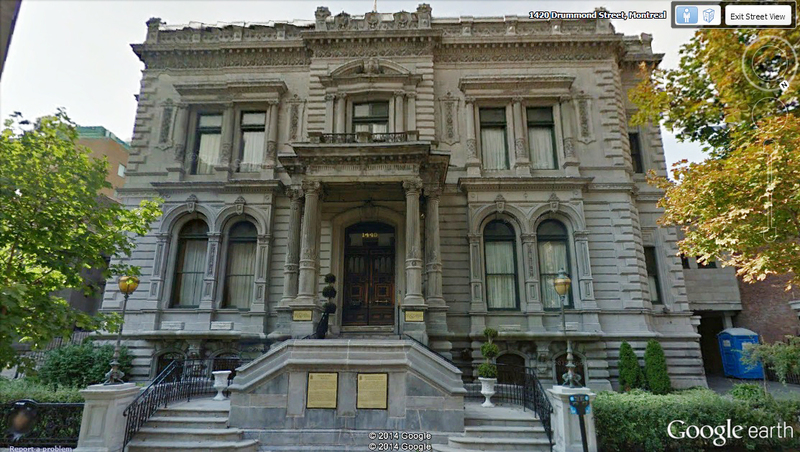 It is the official residence of the lieutenant governor and the Canadian monarch. Built 1800 to circa 1805 when it was first resided in although unfinished at that time. Explore on Google Street View. 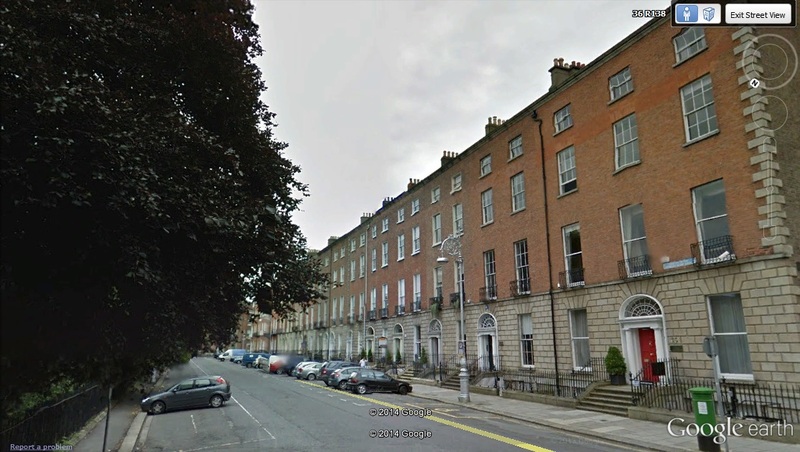 Fritzwilliam Square, Dublin, Ireland (290,600). One of Dublin's famous Georgian squares. The square was laid out 1789-1792. Explore on Google Street View. Washington Square Park, Manhattan, New York City (3,437,202). During the 1830's it was one of the most fashionable addresses in the entire city. Explore on Google Street View. Within the areas that constitute the DESW discussed in this article there have been many modern colonial powers that have at some point had power over the same areas. These include: France, The Netherlands, Portugal, Russia, Spain, and Sweden. The most prevalent examples that can still be found today reside in Quebec and South Africa. Dutch colonization in southern Africa begun in 1652 when a refreshment station for sailors was founded in Cape Town. In 1795 the British took control of the Dutch possession but they later gave it back only to finally annex it in 1806. Quebec started as New France and its first settlement, Quebec City, was established in 1608. New France existed until 1763 when France ceded the possession to Britain. During the time that these areas were being colonized many Europeans settled in these areas and developed a vernacular style of architecture reflecting both their homeland in Europe and the conditions and materials present in the lands they were colonizing. Even after Britain took control of these areas, many of these vernacular styles continued to propagate. Some of the most noticeable characteristics of Dutch colonial architecture and its derivatives include: rounded gables, H-shape, whitewashed exterior, and a thatched roof. Many times oak trees were planted around them as seen in Stellenbosch. Below are examples of architecture found from the remnants of the Dutch colonization of southern Africa. Tulbagh, Cape of Good Hope (South Africa). Explore on Google Street View. Graaff-Reinet, Cape of Good Hope (South Africa), home to 10,083 inhabitants in 1904. Explore on Google Street View. Stellenbosch, Cape of Good Hope (South Africa), home to 4,969 inhabitants in 1904. Explore on Google Street View. 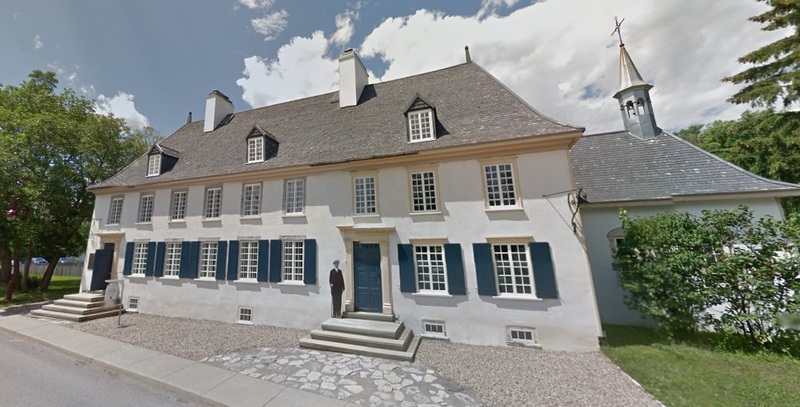 Mauvide-Genest Manor, l’Île d’Orléans, Quebec. Built between 1734-1752. Explore on Google Street View. Boucherville, Quebec near Montreal. Explore on Google Street View. 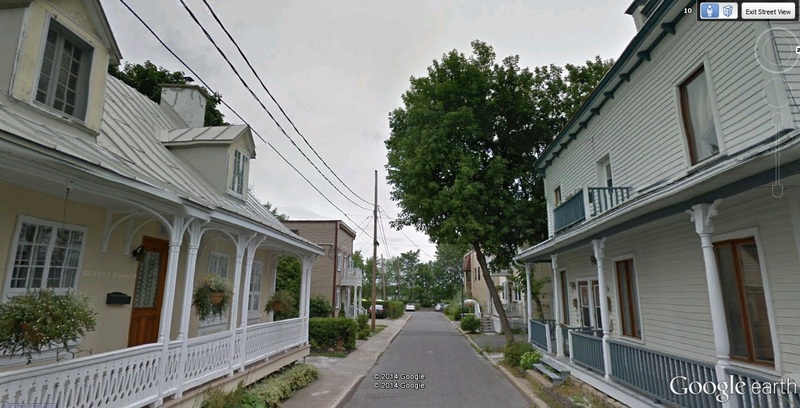 Townhouses in Quebec City, Quebec. The city was home to 68,840 inhabitants in 1901. Notice that the two townhouses both have two rows of dormers. Explore on Google Street View. Louis Bolduc House, Ste. Geneviève, Missouri, United States. The municipality was home to 1,707 inhabitants in 1900. The house was built in 1792 and is an example of Poteaux-sur-sol construction. Explore on Google Street View. Vernacular creole cottages lining this section of street in the French Quarter of New Orleans. The municipality was home to 287,104 inhabitants in 1900. Explore on Google Street View. Hi Billy, a +1 for this very passionate, instructive and very interesting article, and those old photographs are amazing too!